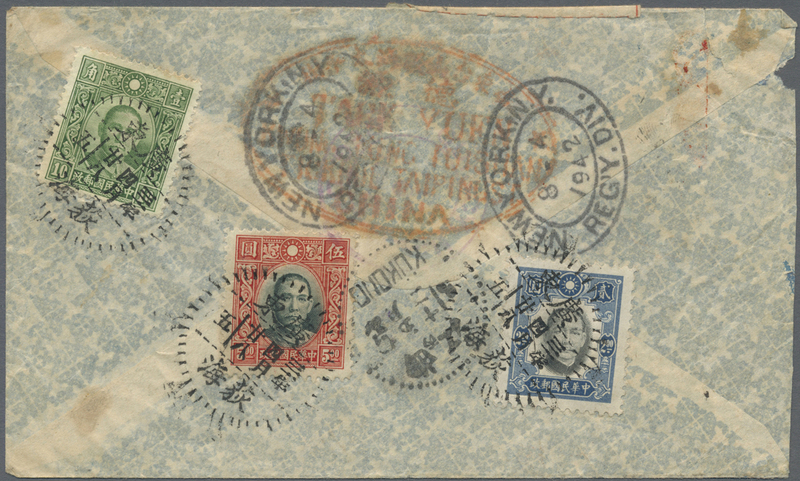 6104 ungebraucht ohne Gummi (unused without gum) (*) Paar (few) 321U/338U-ex 1941, martyrs Hong Kong printing, unwatermarked, horizontal imperforated pairs (6), mint no gum: 1/2 C. dark sepia, 4 C. grey blue, 5 C orange red, 15 C. brown violet, 20 C. blue, 40 C. orange (CSS 538Aa, 541b, 542b, 543g, 544h, 548f). 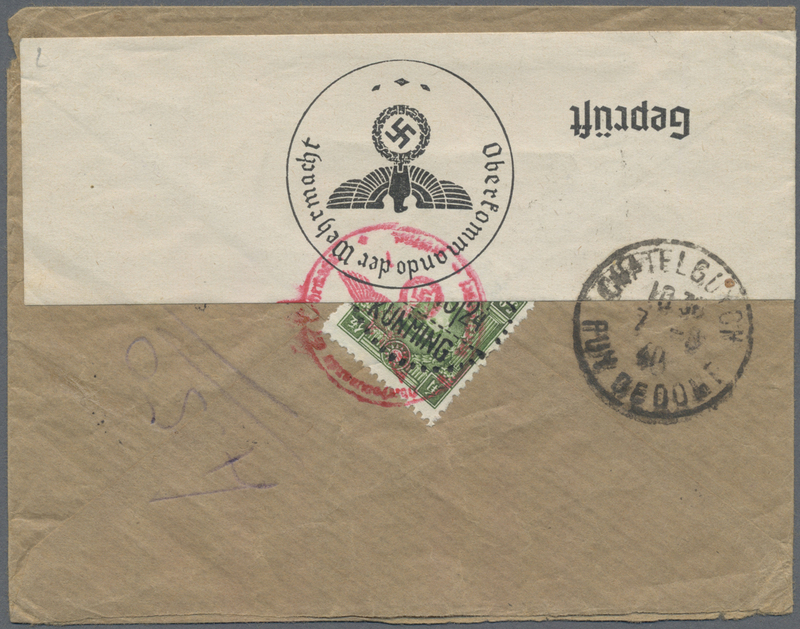 6105 postfrisch (never hinged) ** ungebraucht ohne Gummi (unused without gum) (*) 322U, 323U (2) 1941, martyrs Hong Kong printing, unwatermarked, 1 C. horizontal pair imperf. 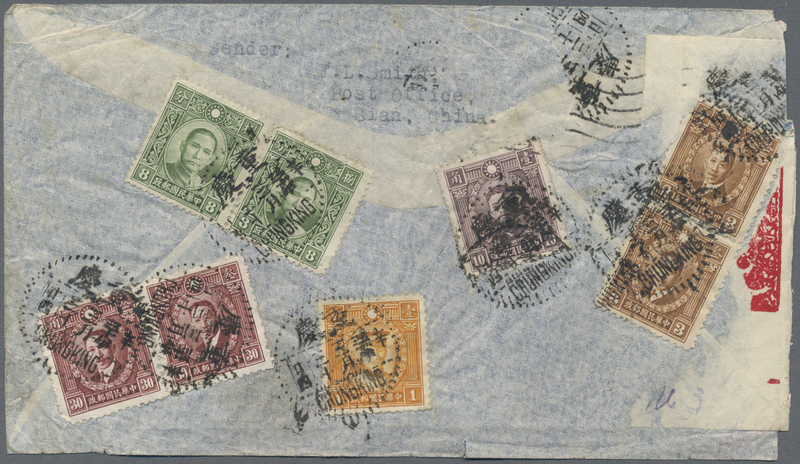 in-between MNH resp. 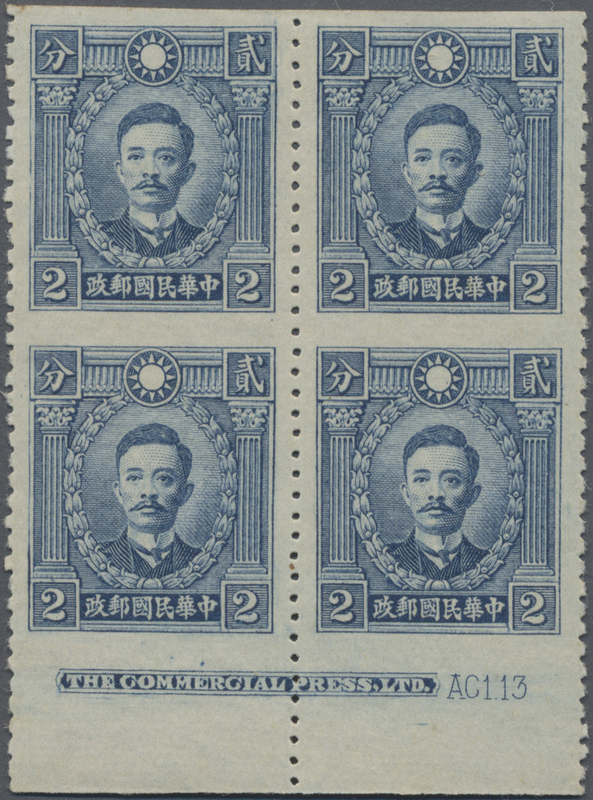 2 C. blue block-4 horizontally imperforated, mint NG (CSS 539g, 540e x2). 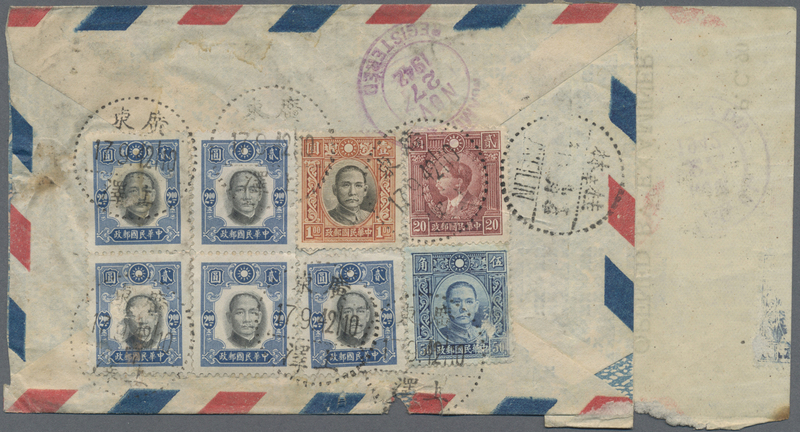 6107 Paar (few) gestempelt (marked) 323U (2), 331U (2), 1941, martyrs Hong Kong printing, unwatermarked, horizontal imperforated pairs, used "CANTON": 2 C. blue, 15 C. brown violet with left margin and colour spot in left column pos. 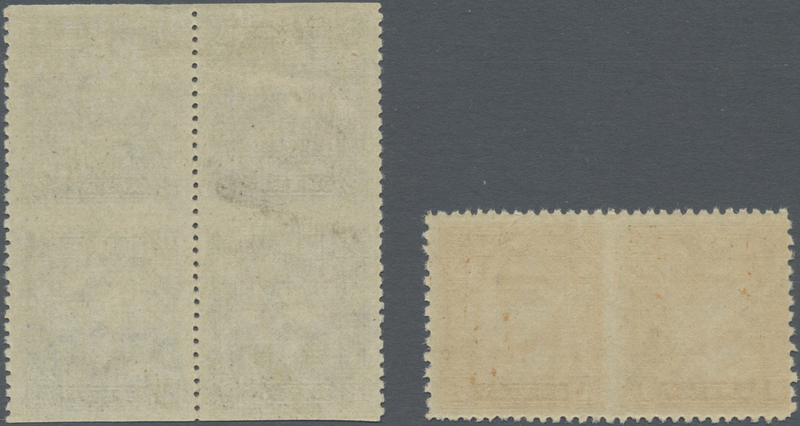 6/25, 40 C. orange (CSS 540f, 543g, 546g). 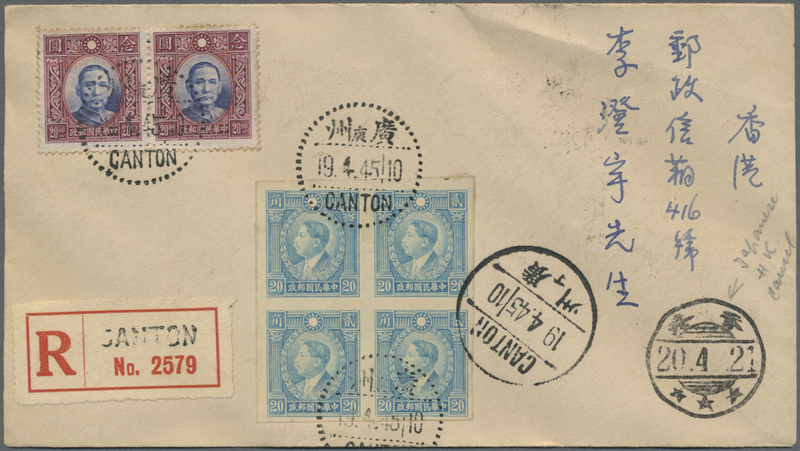 6109 Brief (cover) 330U (4), 330 (3) et 1941, martyrs Hong Kong printing, unwatermarked, 15 C. imperforated block-4 w. on reverse 15 C. perforated strip-3 and jap. 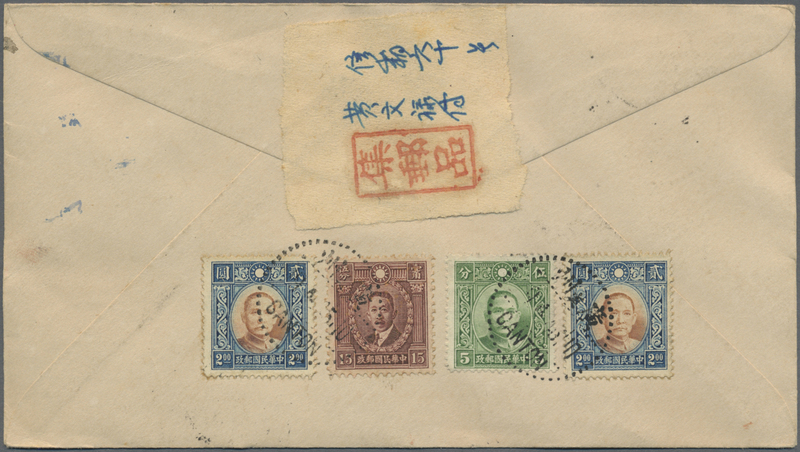 occupation Central China SYS $10/16 C., $2/5 C. (2), $6 (10 C.), etc. 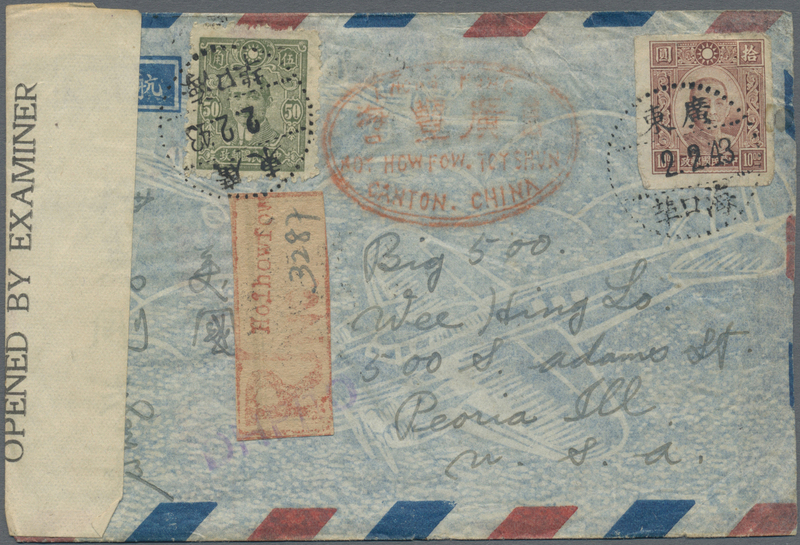 tied "CANTON 34.5.18" (May 18, 1945) to local cover (CSS 543g, 543 etc.). 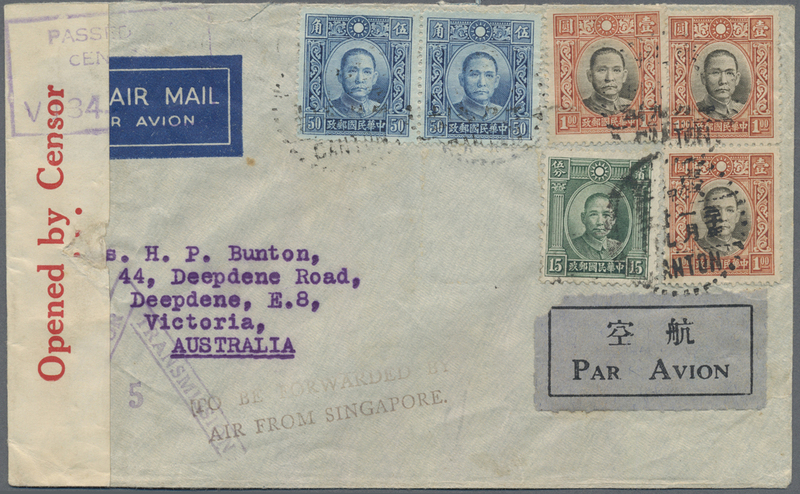 6110 Brief (cover) 333U (4), 320C (2) 1941, martyrs Hong Kong printing, unwatermarked, 20 C. block-4 imperforated with Chung-Hua $20 horiz. 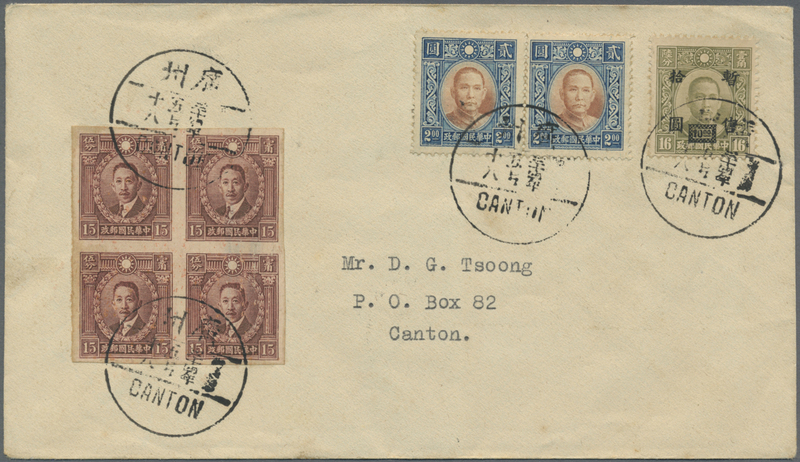 pair tied "CANTON 19.4.45" to registered cover to occupied Hong Kong w. arrival "Hong Kong 20.4.21" or April 21, 1945 (CSS 544h x2 etc.). 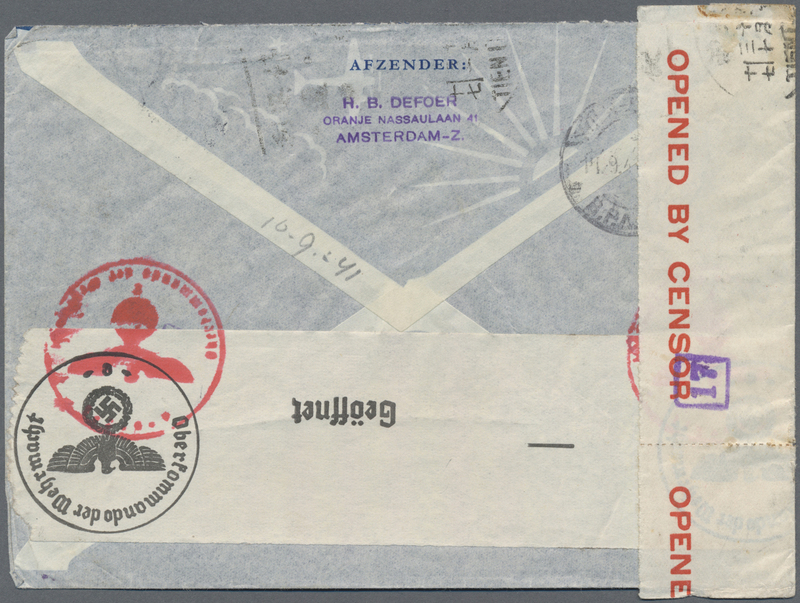 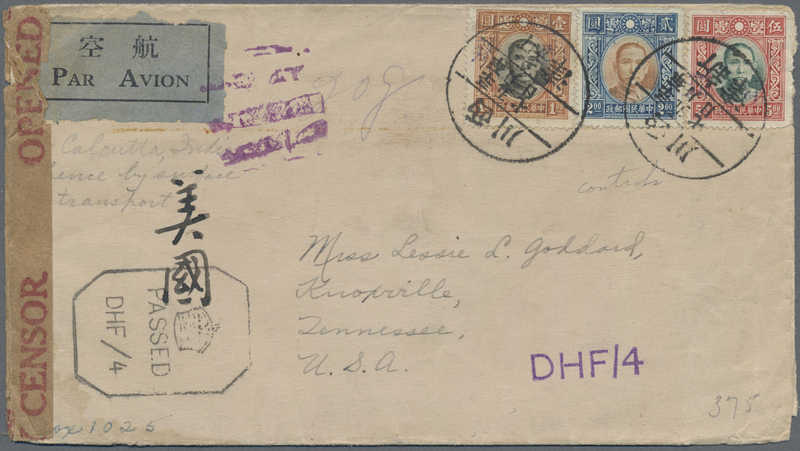 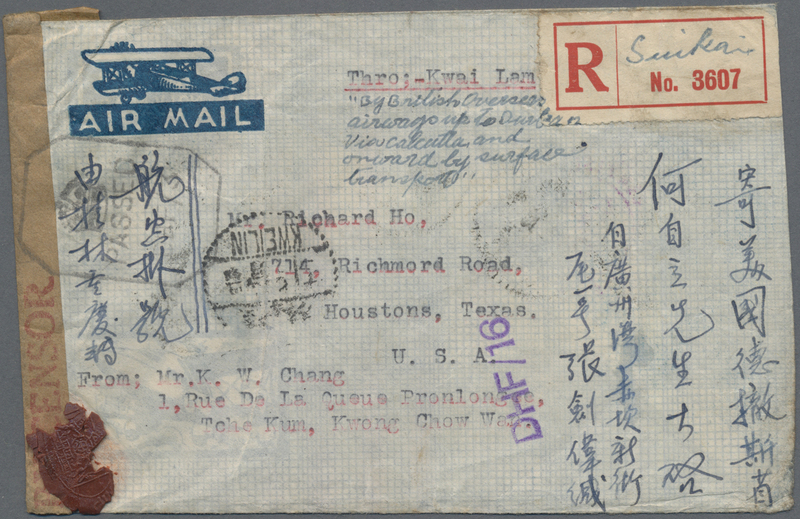 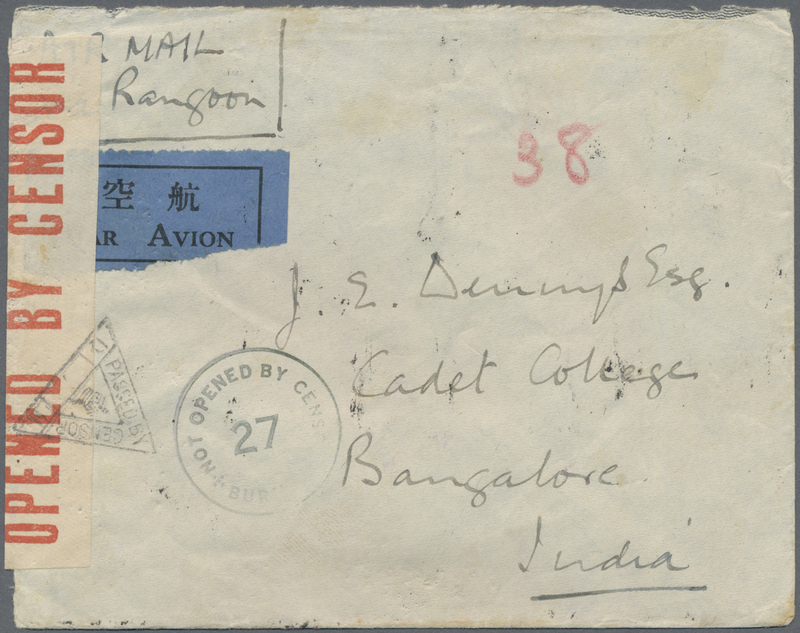 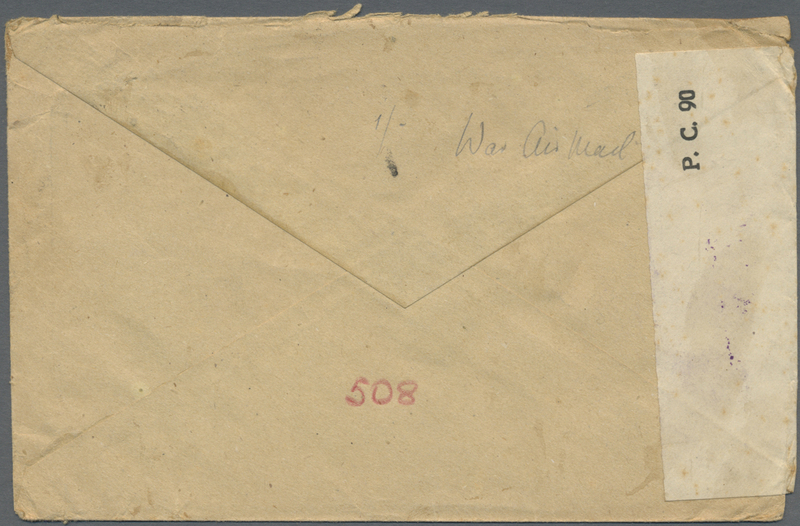 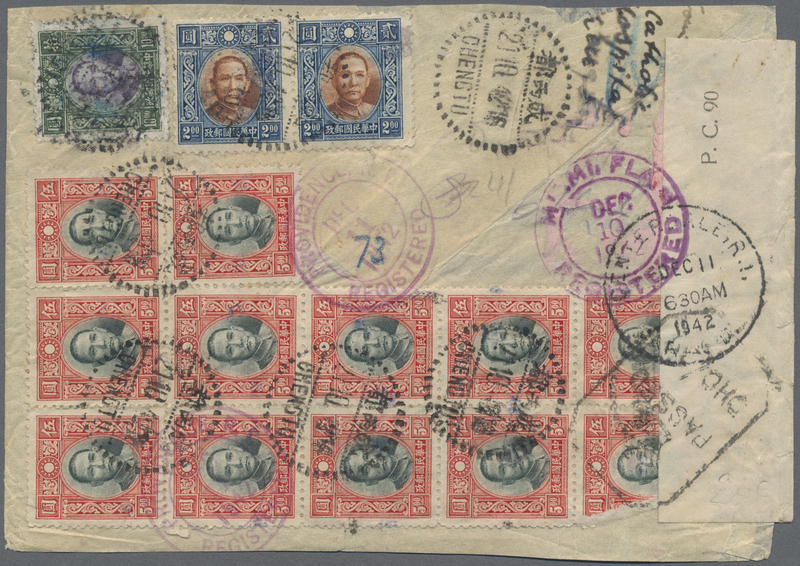 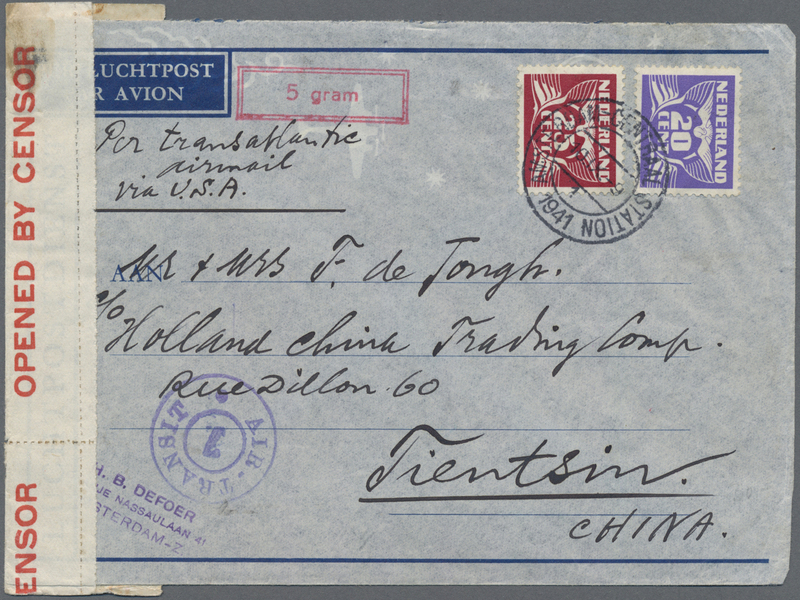 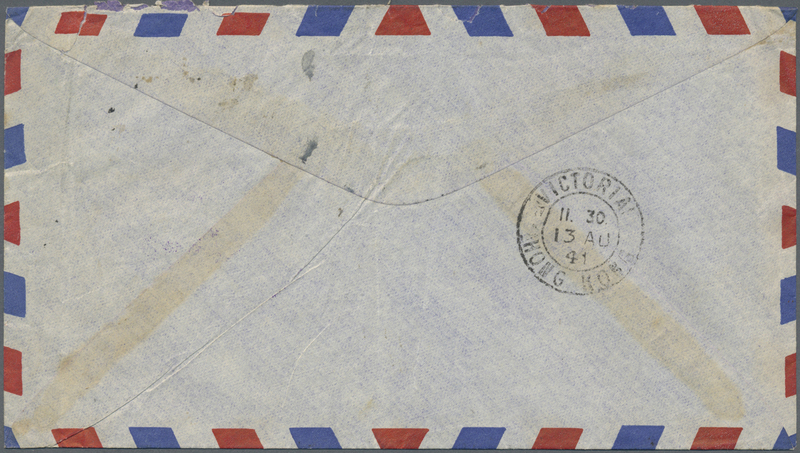 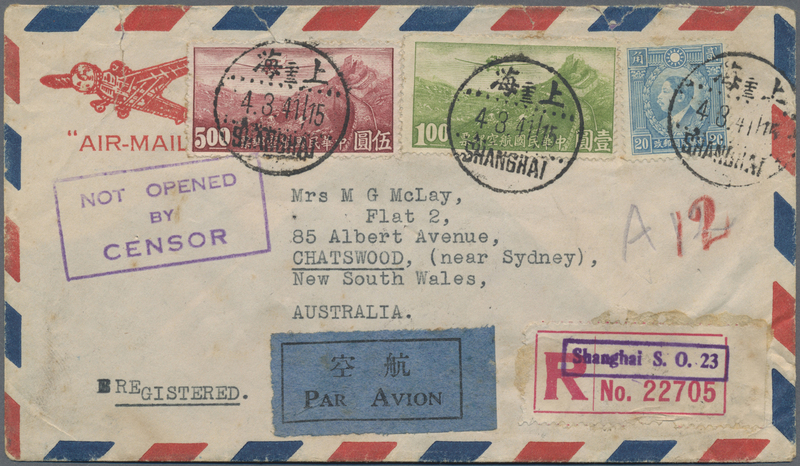 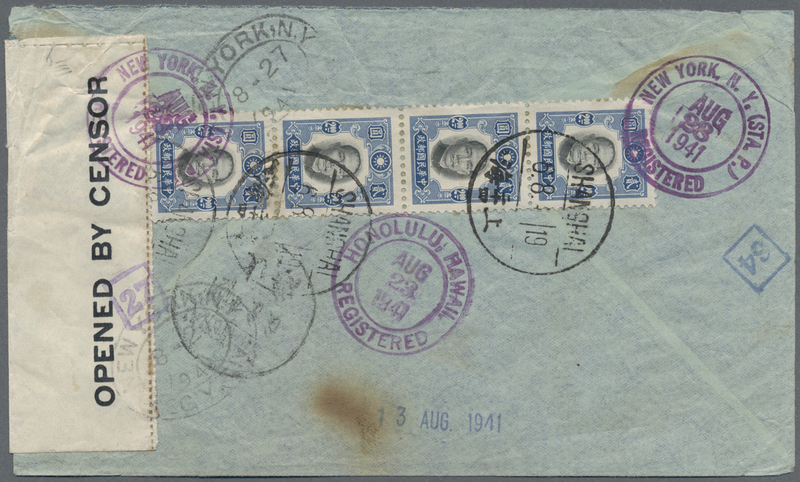 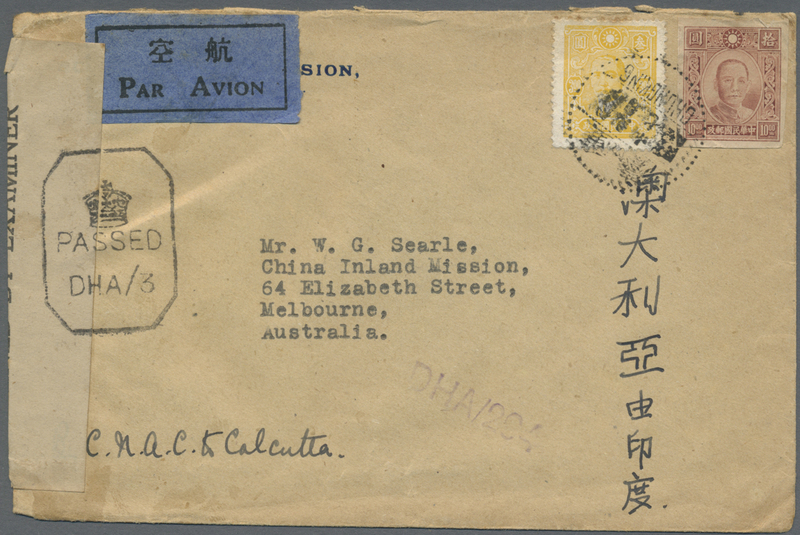 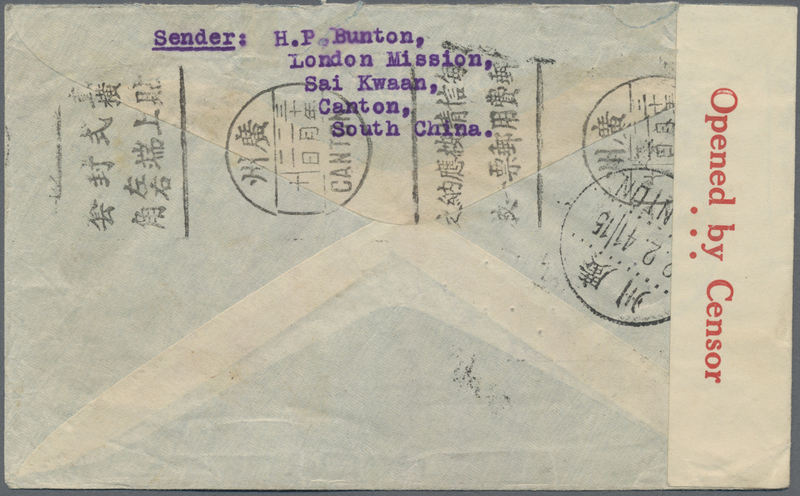 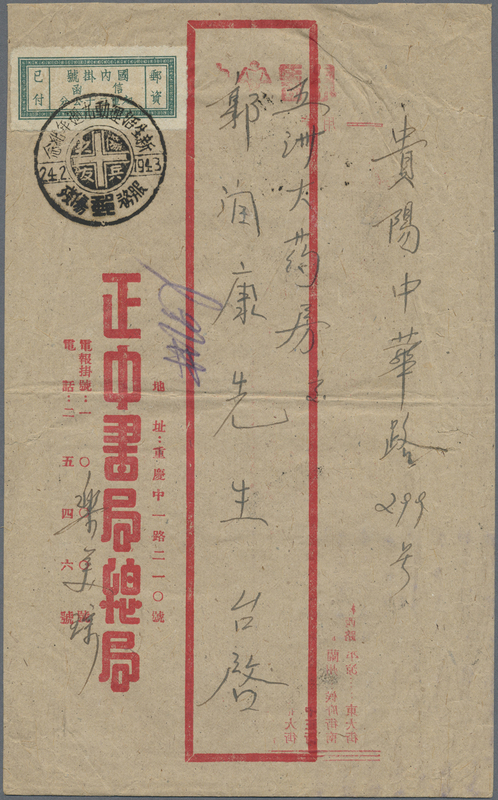 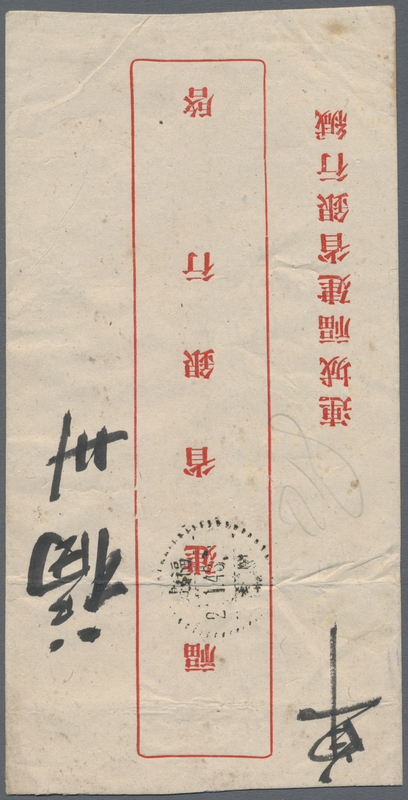 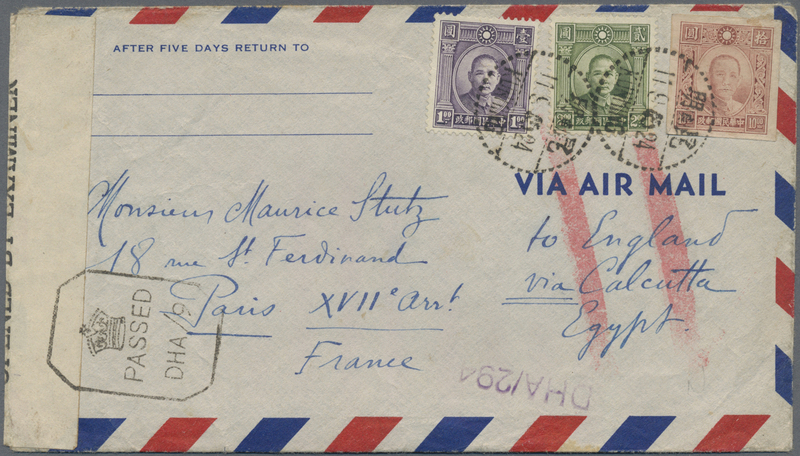 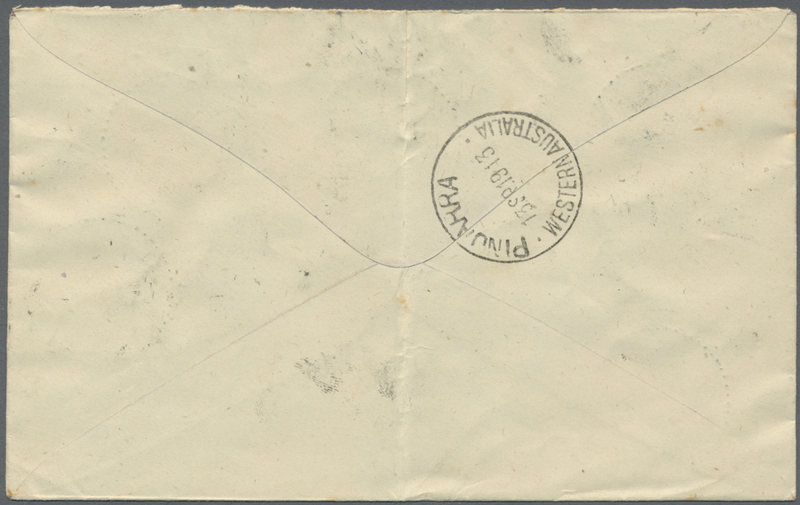 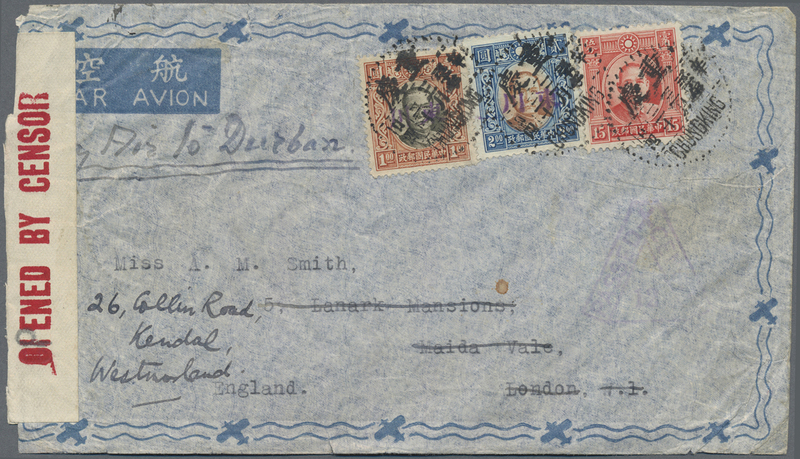 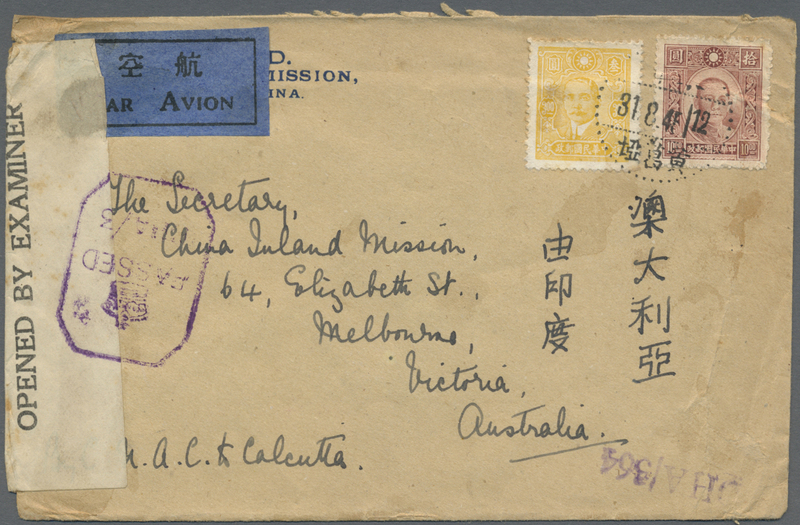 6111 Brief (cover) 1938/41, airmail $2, SYS $5 and 10 C. total $7.20 tied "Kwangtung Suikai 31.8.31" (Aug. 31, 1942) to reverse of registered airmail cover via "Kweilin 31.9.7" and Miami Sept. 8 to Houston/Tx., USA w. Oct. 9 arrival. 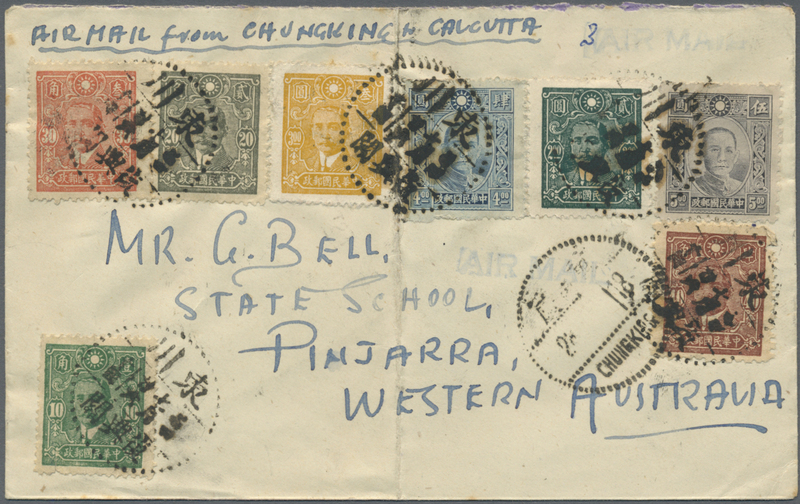 British India censortape. 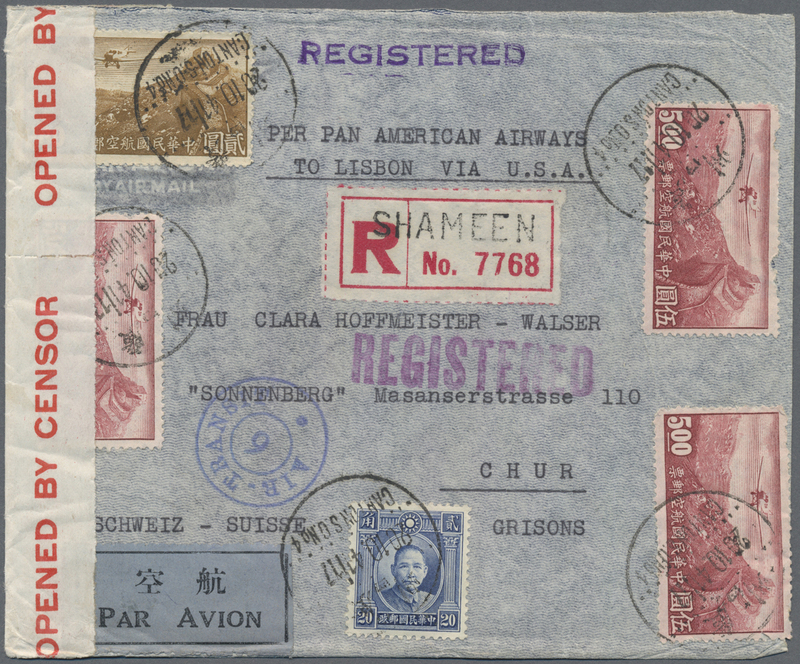 Endorsed "By BOAC airways to Durban via Calcutta and onward by surface transport". 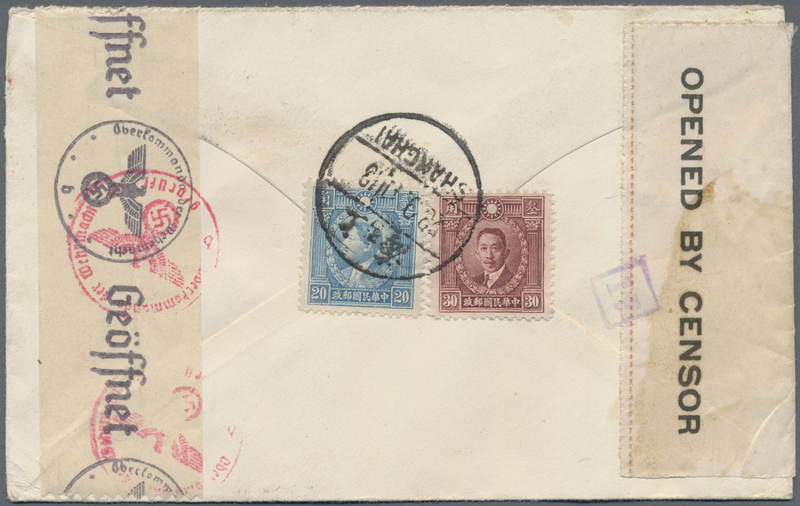 Cover two bends not affecting stamps. 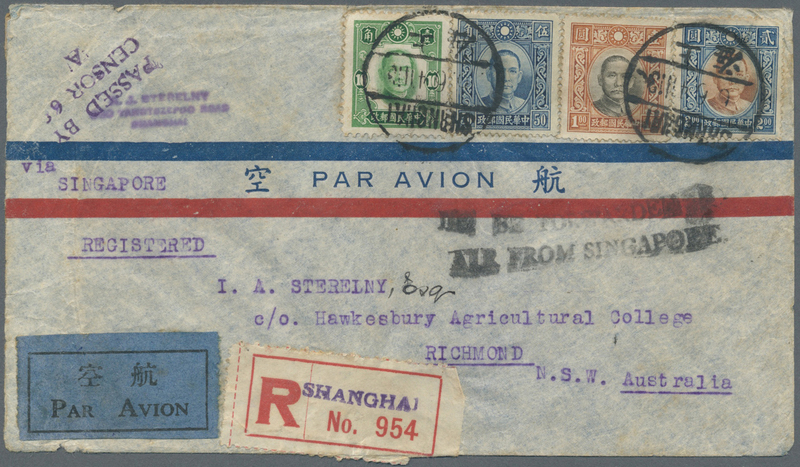 6112 Flugpostbrief (Flight cover) 378 (2), 377 (2) etc 1941, great wall $5 (2), $2 (2, one RC) etc. 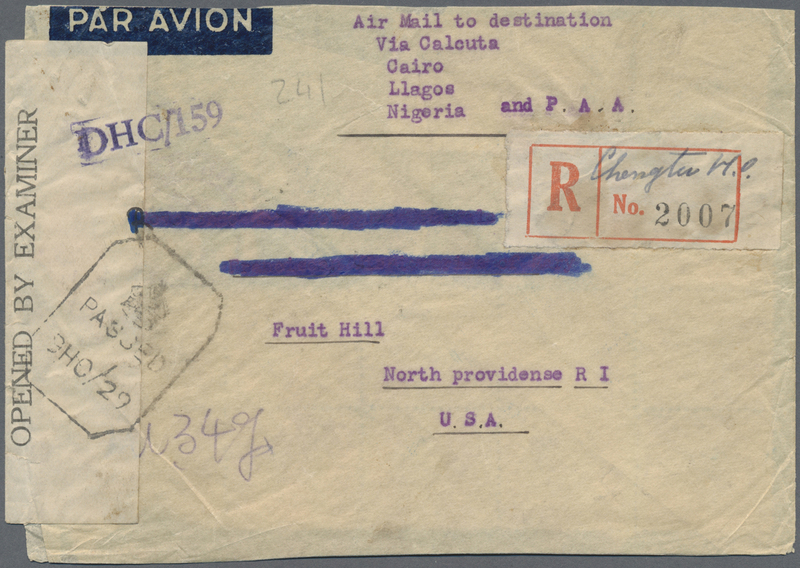 total $14.70 tied "CHENGTU 17.1.43" to registered air mail cover to Helsingfors/Sweden, via India, South Africa, Lisbon and Germany. 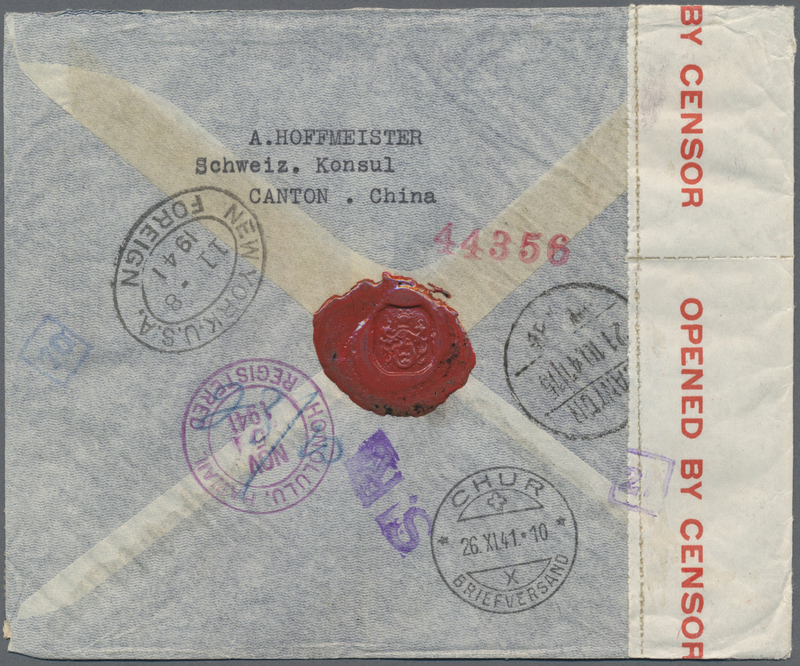 India and Germany double censorship, transits of "LISBOA 23 ABR 43" and "MÜNCHEN 02.5.43". 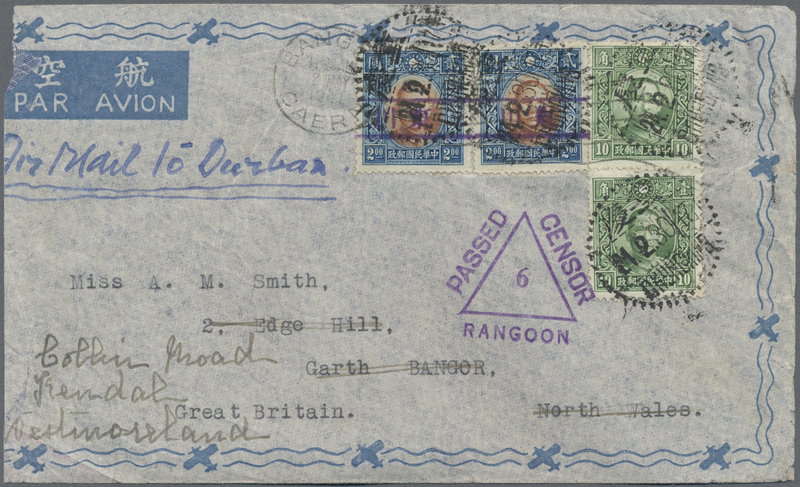 Several censors marks. 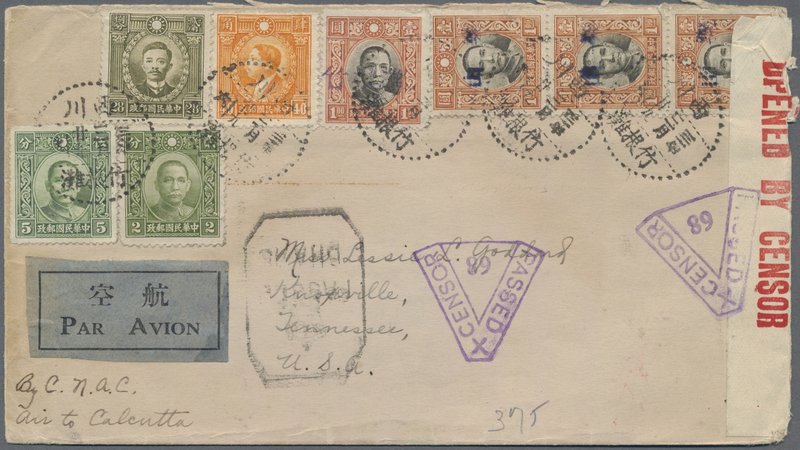 Mounted on exhibition page with rate analysis. 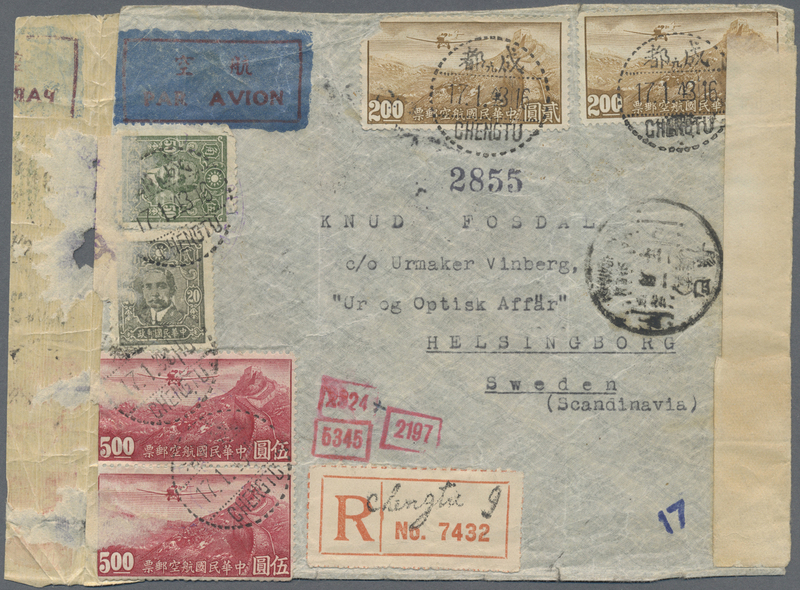 An airmail cover Free China-Sweden crossing allied, neutral and axis territory to neutral Sweden, extraordinary. 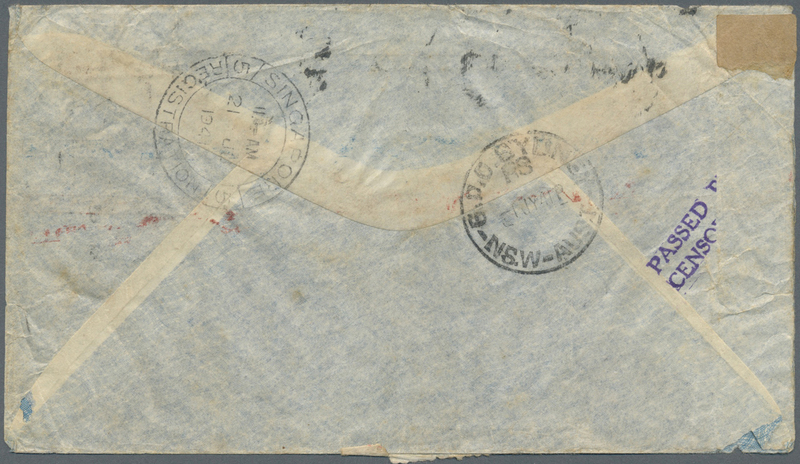 6115 Brief (cover) 406 (5) etc. 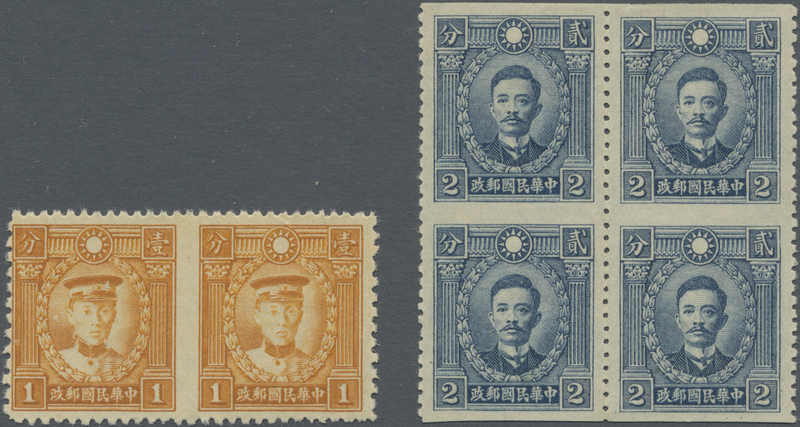 1940/41,SYS NY print $2 (5) etc. 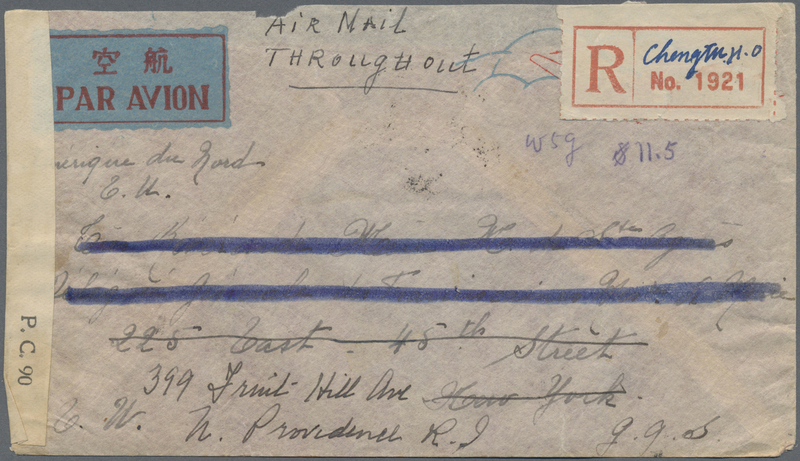 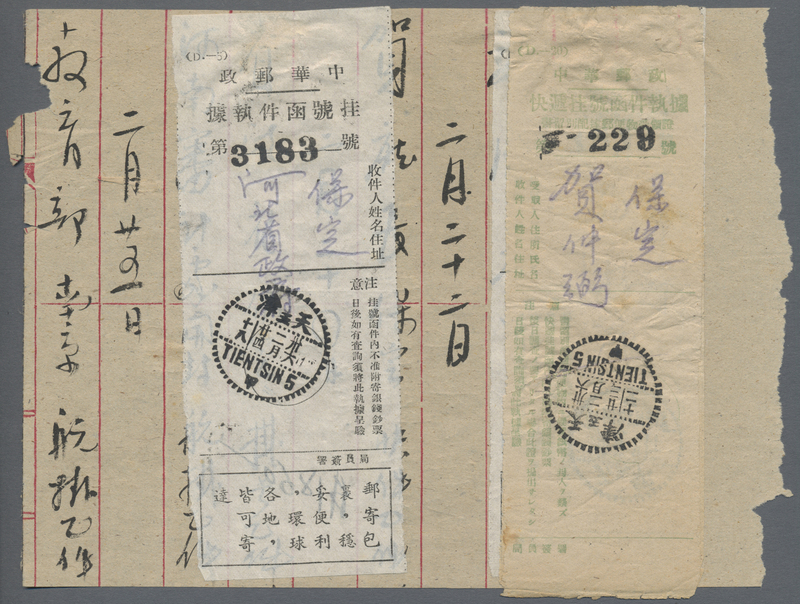 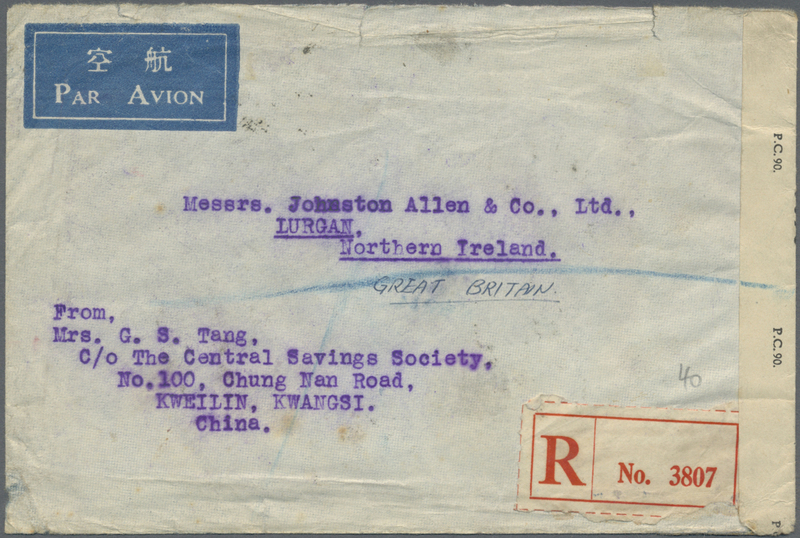 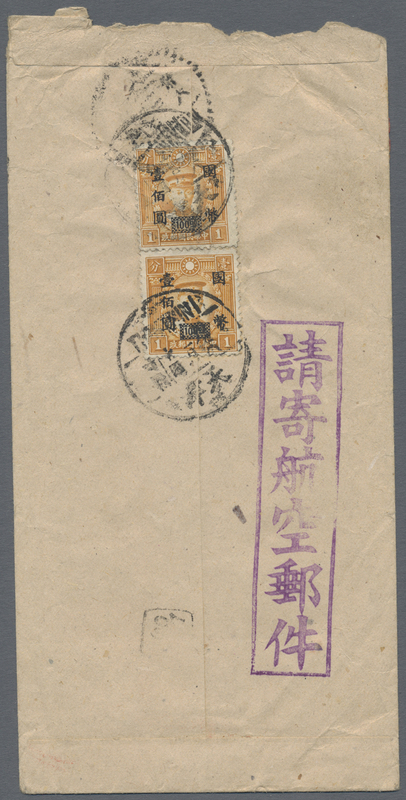 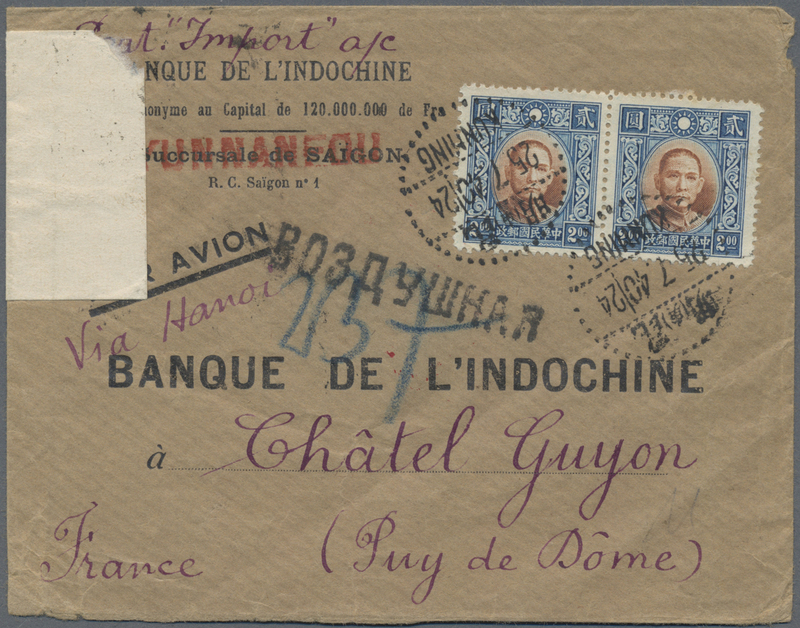 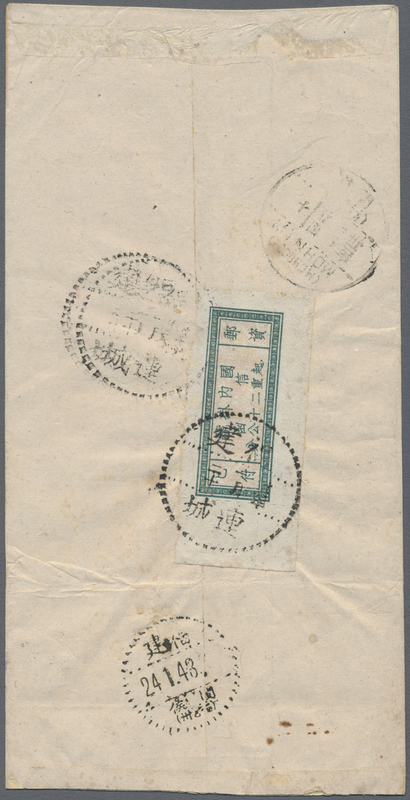 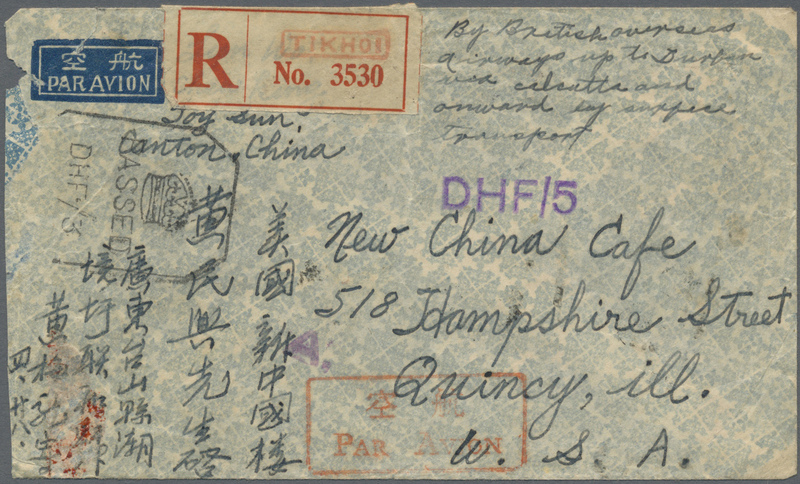 total $11.70 tied "Kwangtung Sneungchak 17.9.42" to reverse of AR-registered airmail cover via "Taishan" same day and Kweilin to Chicago/Ill., USA with Nov. 27/28 backstamps. 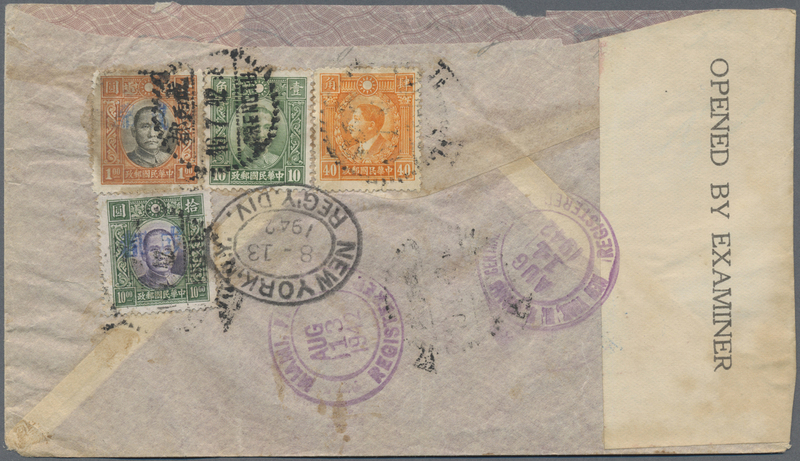 20, 50 C. and cover slight faults. 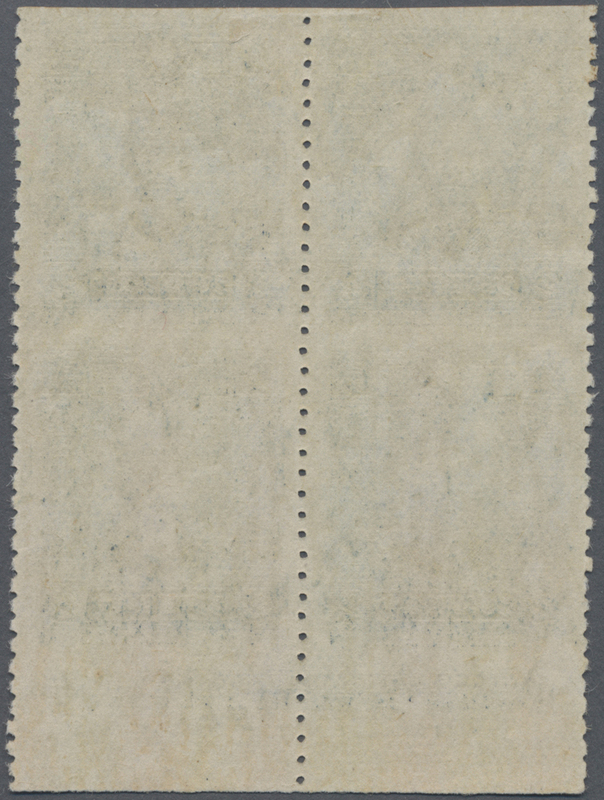 British censortape PC 90. 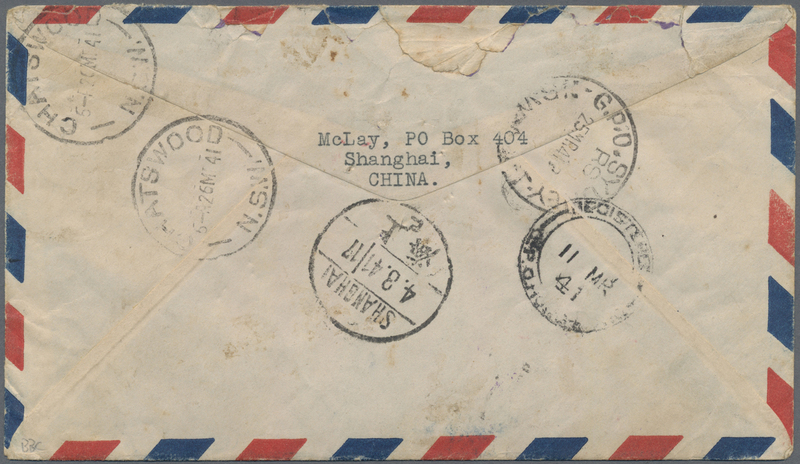 6118 Brief (cover) 339 (8) etc. 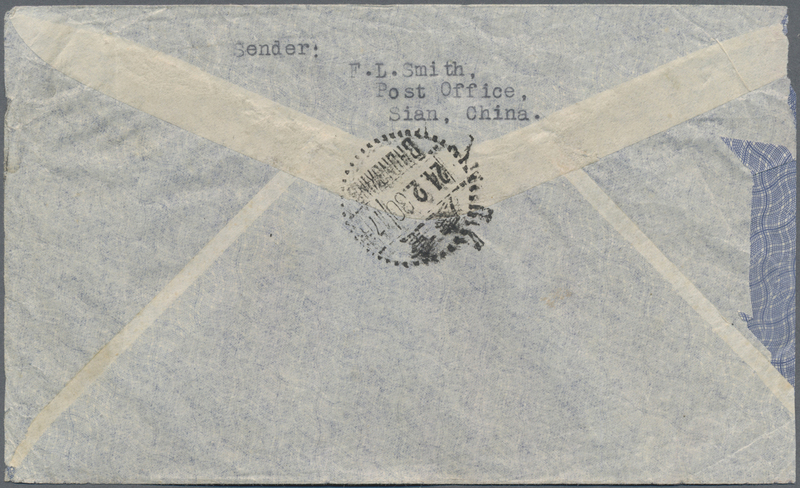 1941, Dec. 8: pacific war opening day foreign airmail cover, total $4.22 tied "Anhwei Suhsien 30.12.8" to reverse of airmail cover to Rochester/NY, USA. 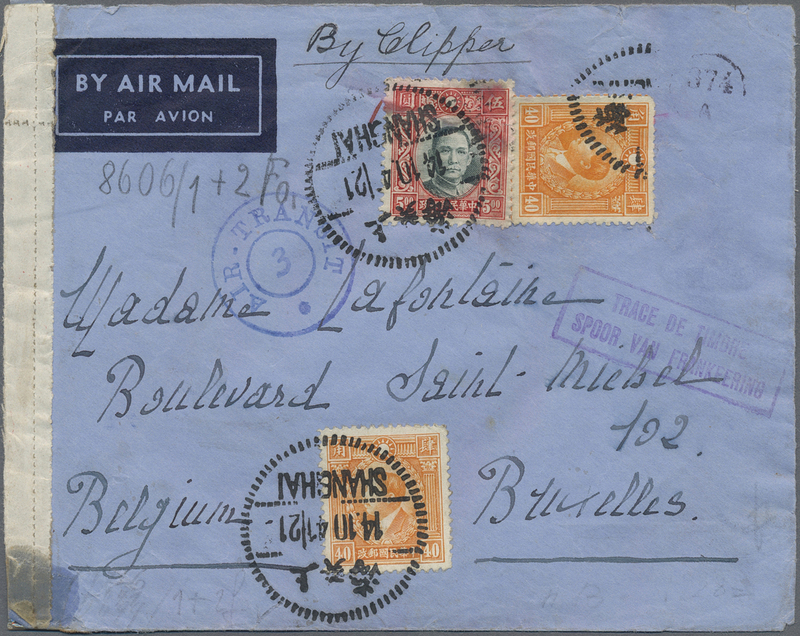 Further transmission of airmail was halted from Dec. 16. 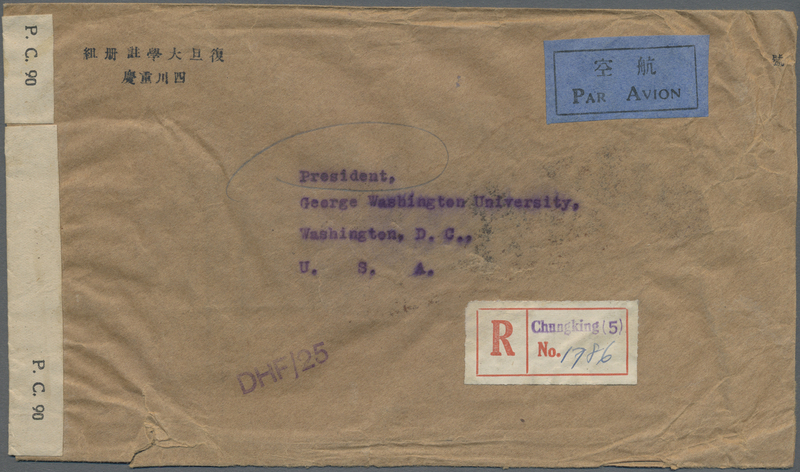 Handwritten notation of the fact and includes sheet stating: "Letter written Dec. 7, 1941 and mail Dec. 8, 1941 in A.M. after hearing of the outbreak of the war between Japan and the U.S.A. 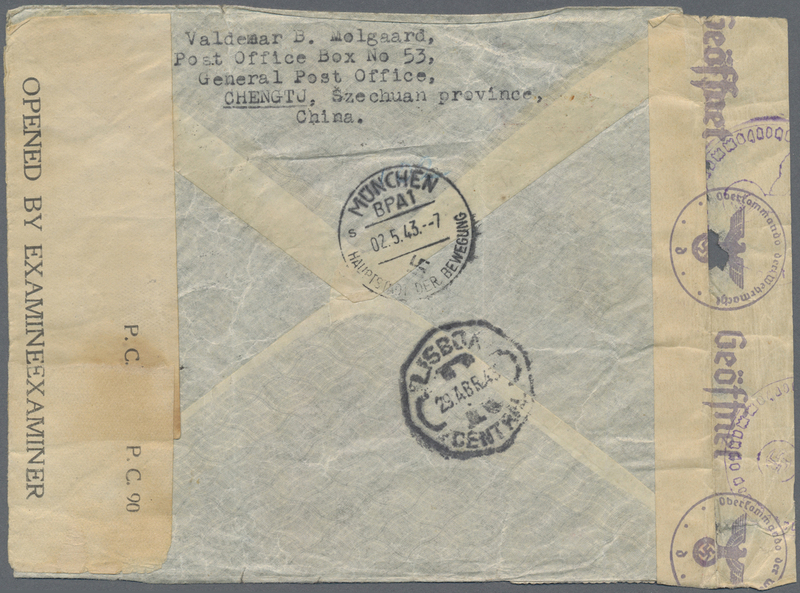 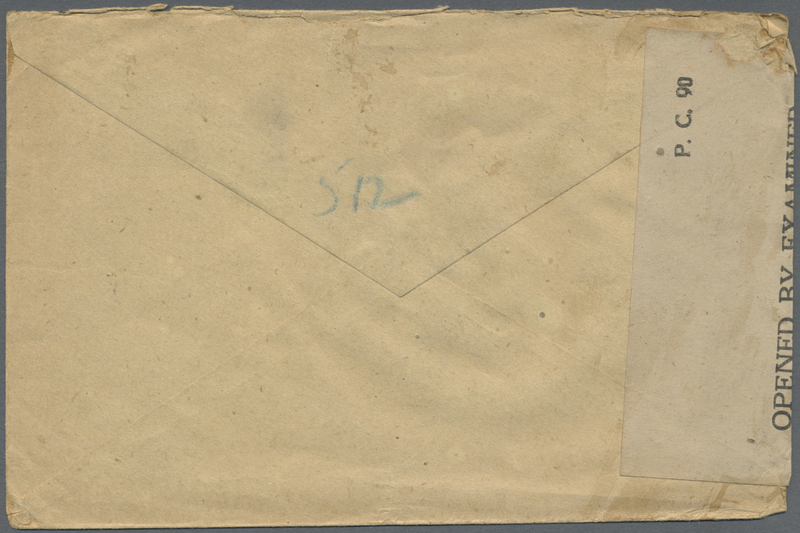 The letter arrived in Rochester, N.Y., Jan. 16, 1943". 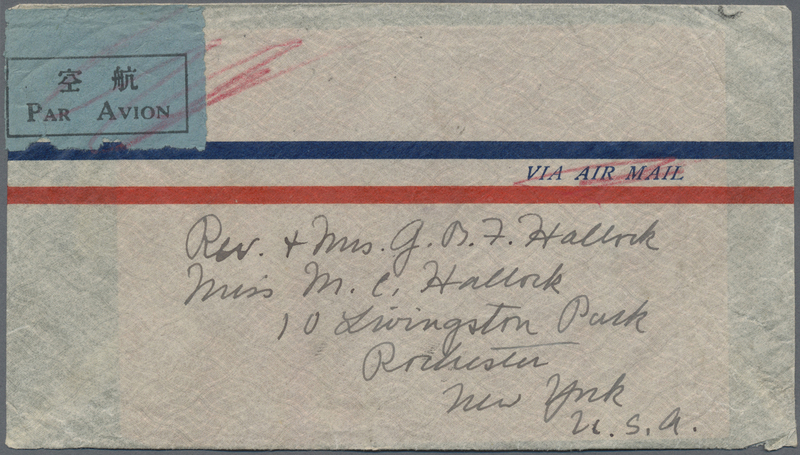 Sender Adellia Hallock (wife of Ted Hallock). 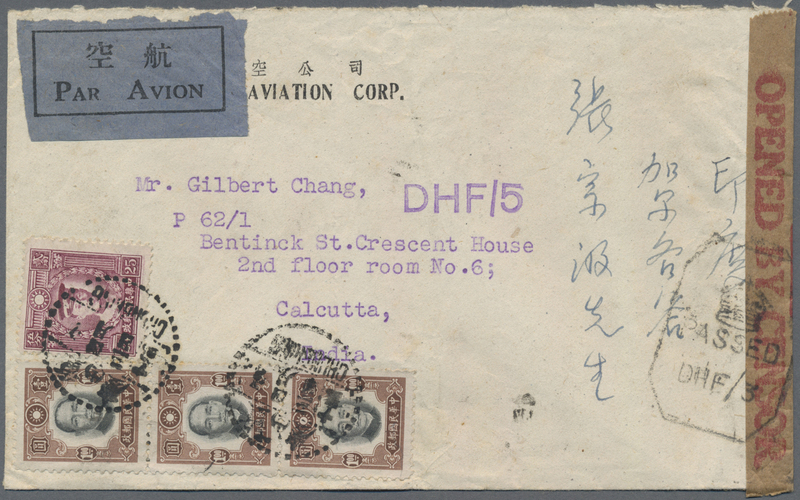 6119 Flugpostbrief (Flight cover) 415A etc. 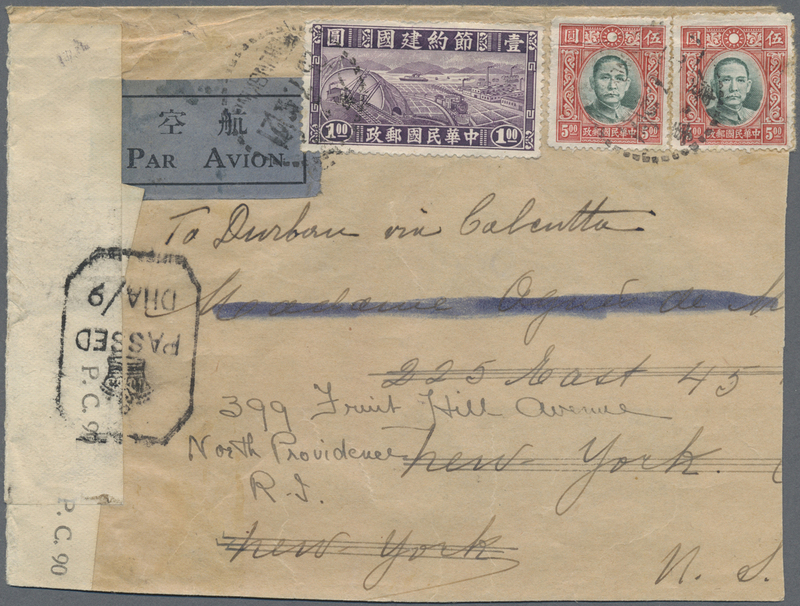 1941, reconstruction $1 violet with SYS $5 (2) tied "CHUNGKING 25.7.42" to air mail cover to New York and fwd. 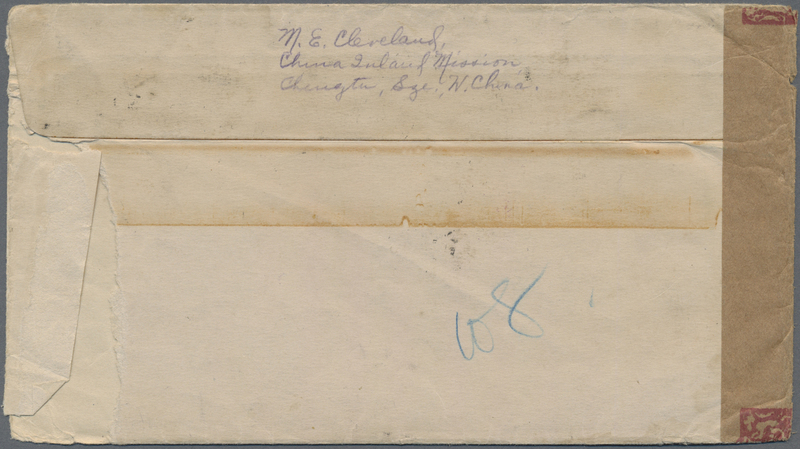 to North Providence, R.I. 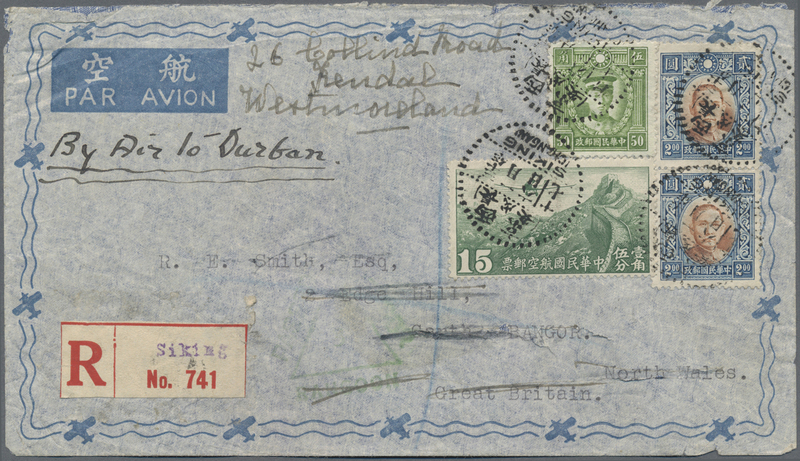 Endorsed "To Durban via Calcutta". 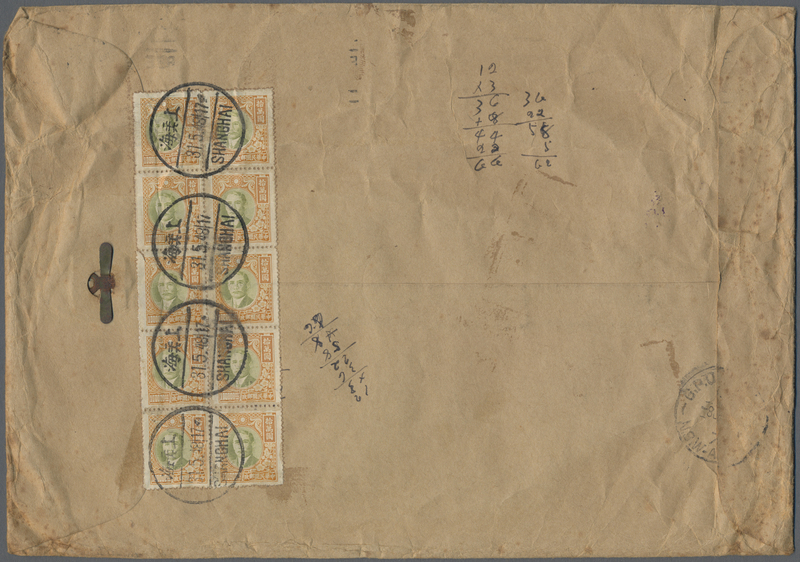 India censor tape tied by Calcutta censor marks. 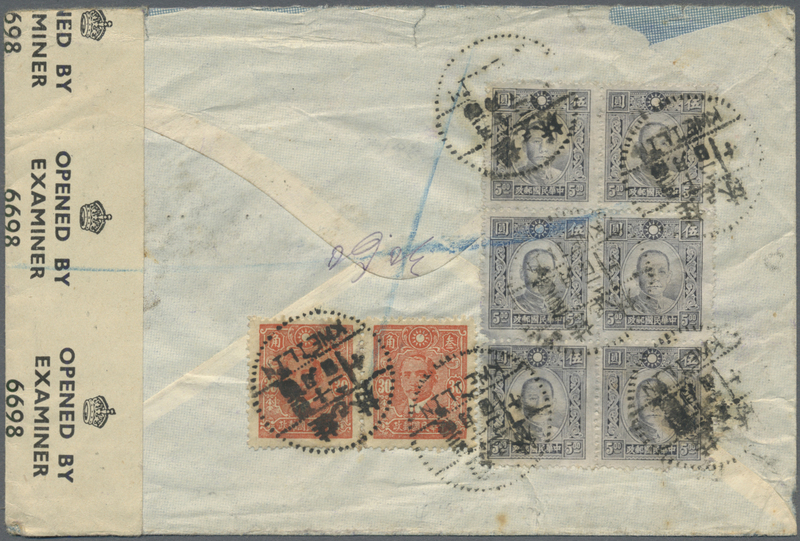 A double weight cover with $5 air surcharge x2, opened out for display, faults. 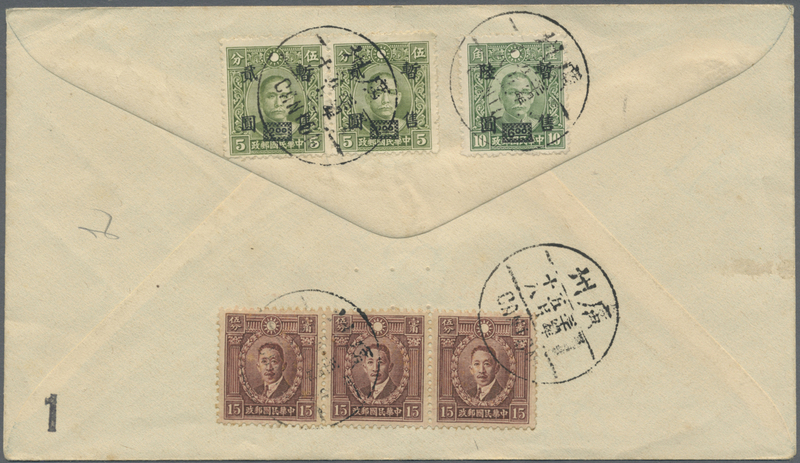 6125 Brief (cover) 427 1942, registration stamp, a left margin copy tied "Fukien.Liencheng 32.1.20" (Jan. 20, 1943) to reverse of reg. 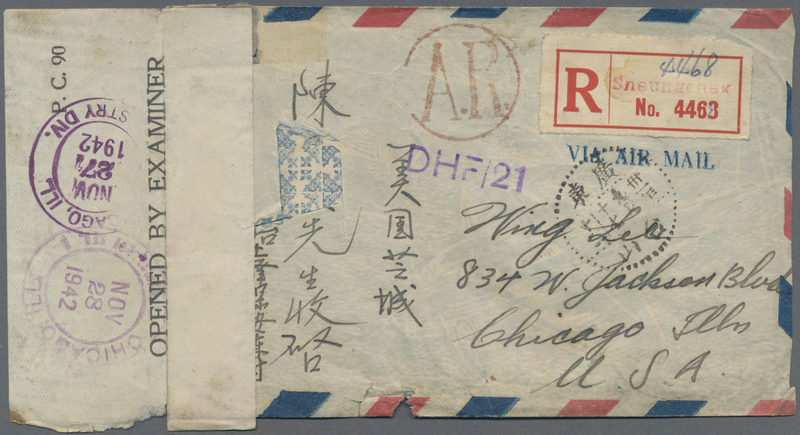 cover to Foochow w. Jan. 24 arrival. 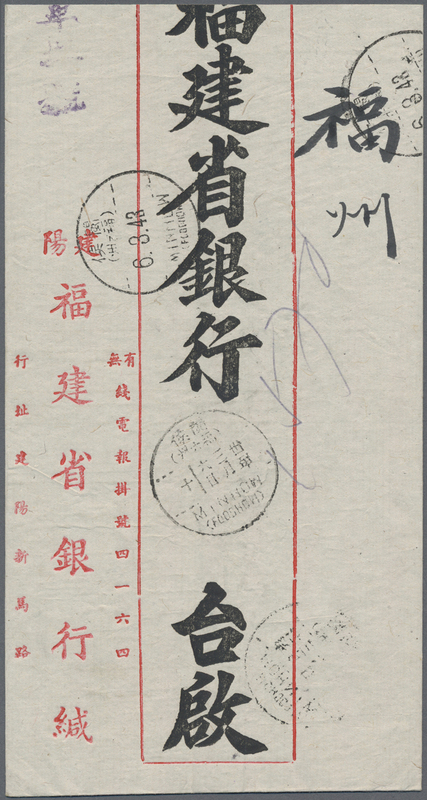 Endorsed "single" (registration). 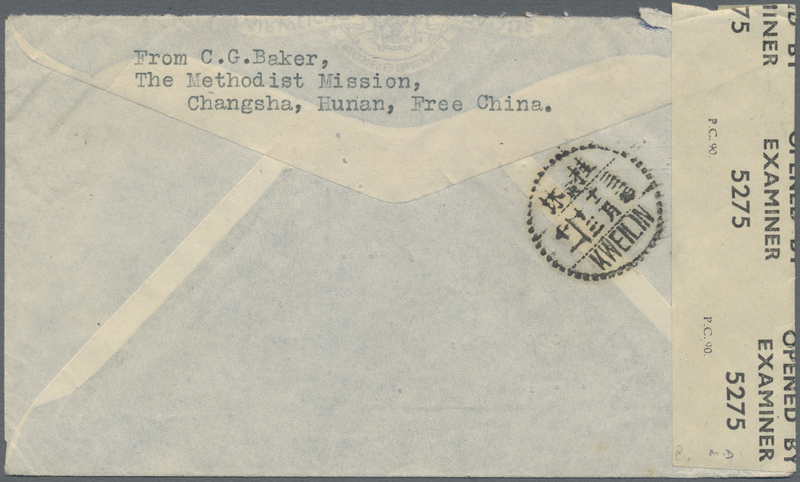 Sender Fukien provincial bank Liencheng branch to Fukien bank head office. 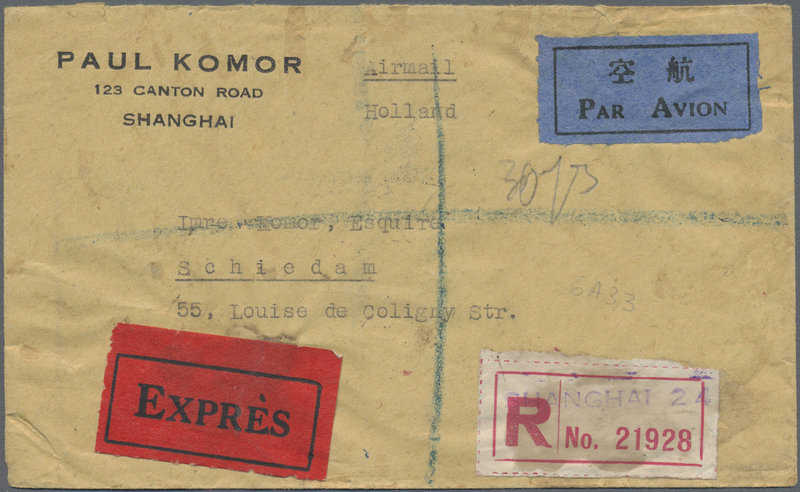 Plus two 1947 receipts for express (green) and registered mails (black). 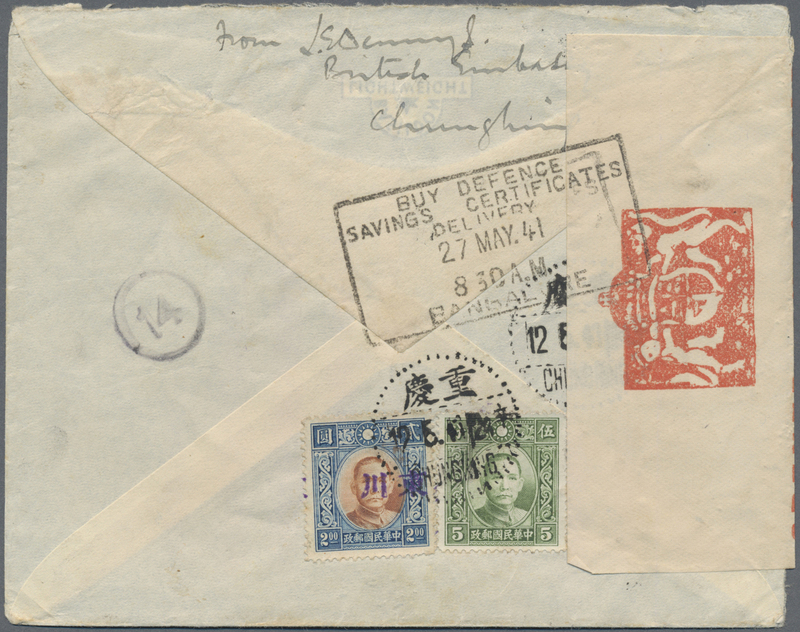 6126 Brief (cover) 427 1942, "registration fee paid" stamp tied large commemorative dater "New Life Movement Ninth Anniversary Chungking 24.2.43" w. on reverse 10 C. Da tung (3) resp. 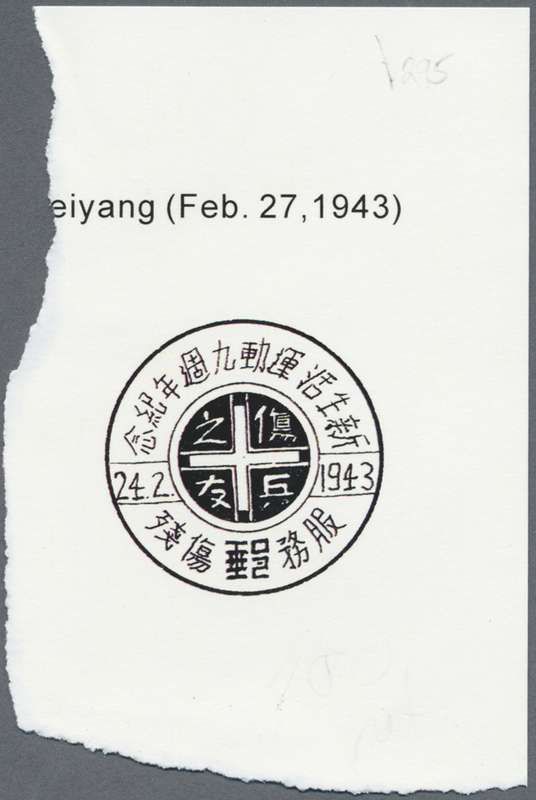 10 C. NY print (2) to registered cover to Kweiyang w. Feb. 27 arrival. 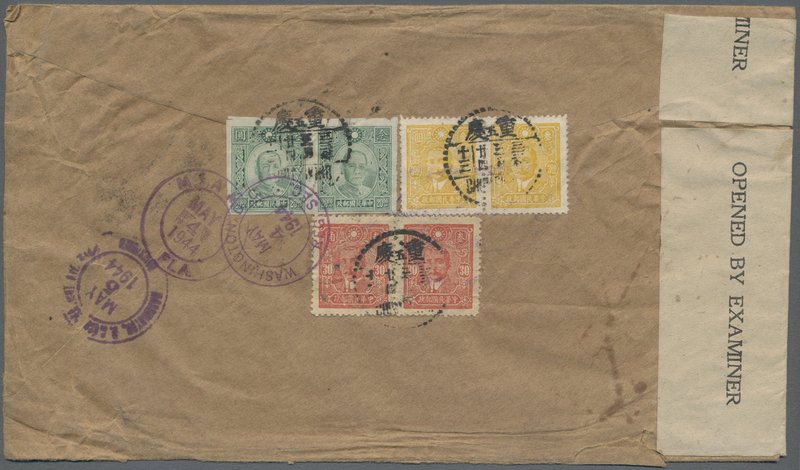 The stamp covered basic rate 50 C. + 1.50 reg. 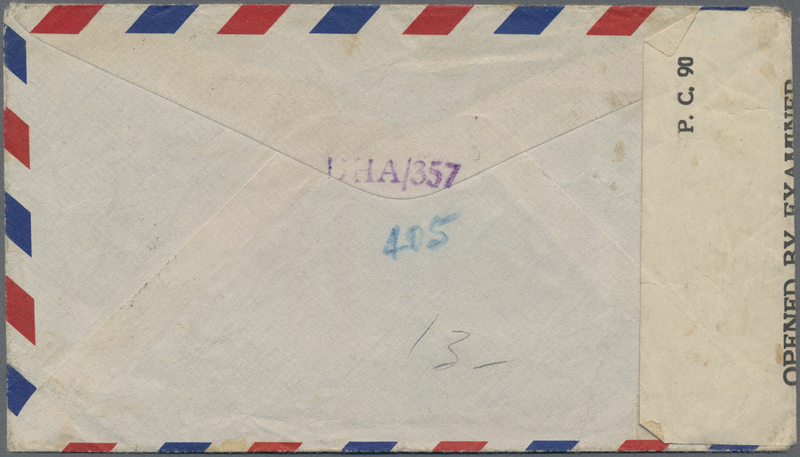 the uprate was for higher weight. 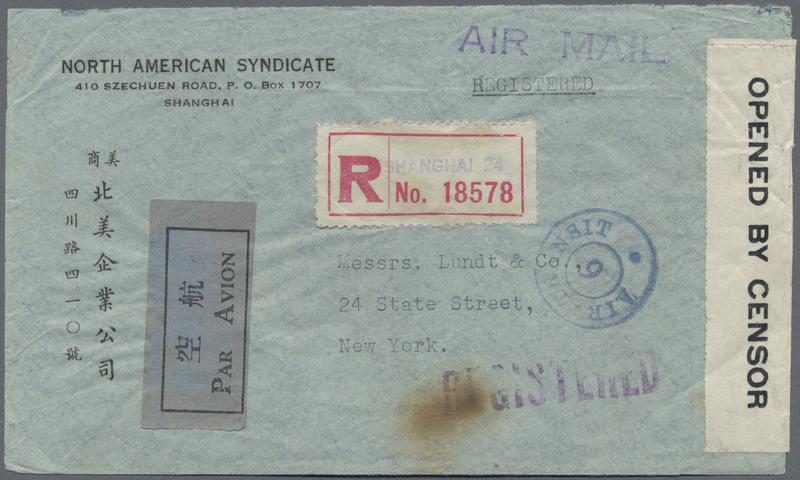 - The movement was a sort of Chinese National Red Cross. 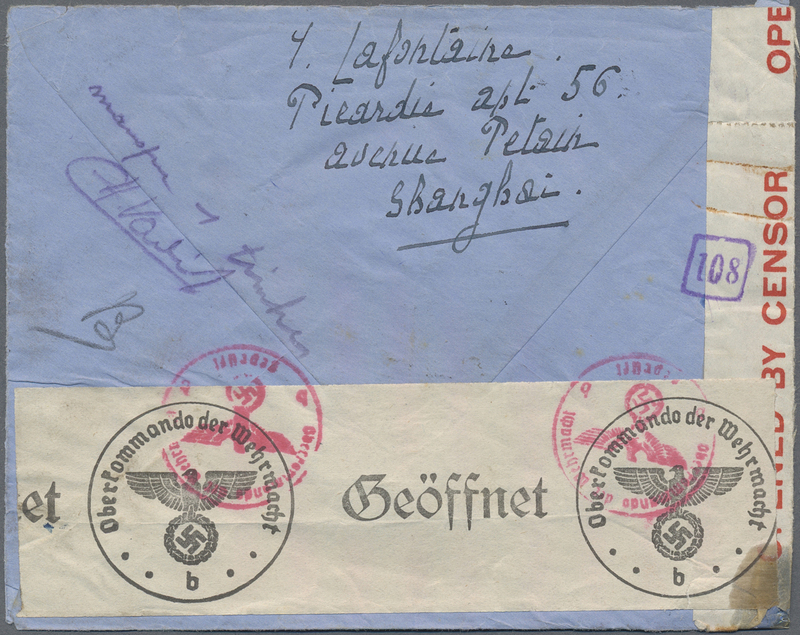 Full transcription/translation of the postmark included. 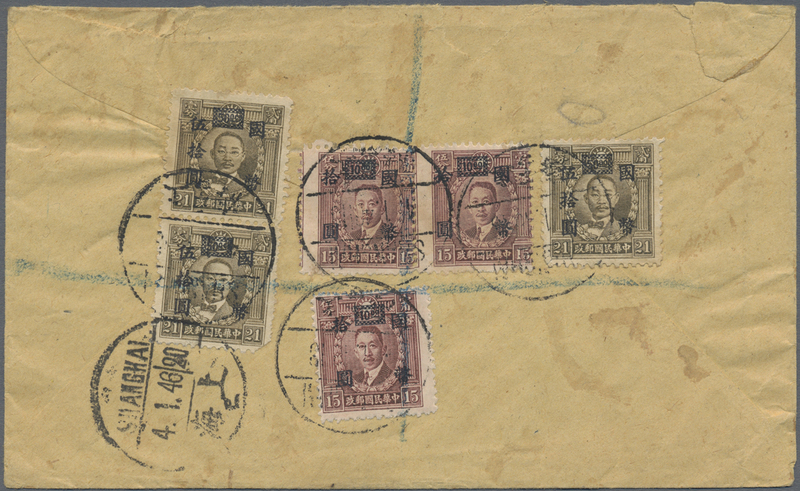 6127 Brief (cover) 1943/47, express covers with scarlet labels used inland (3) or foreign (2, inc. cover New York-Shanghai w. US stamps removed, SYS plum blossoms affixed and fwd. 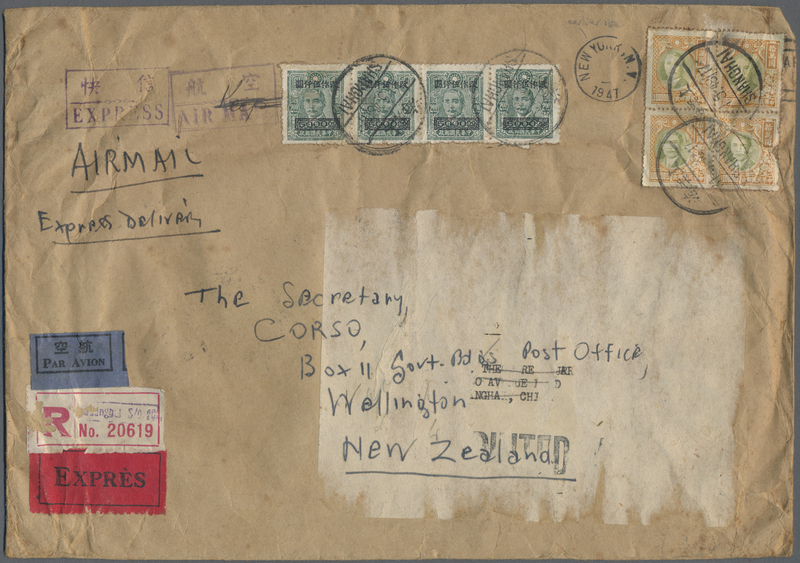 to New Zealand ). 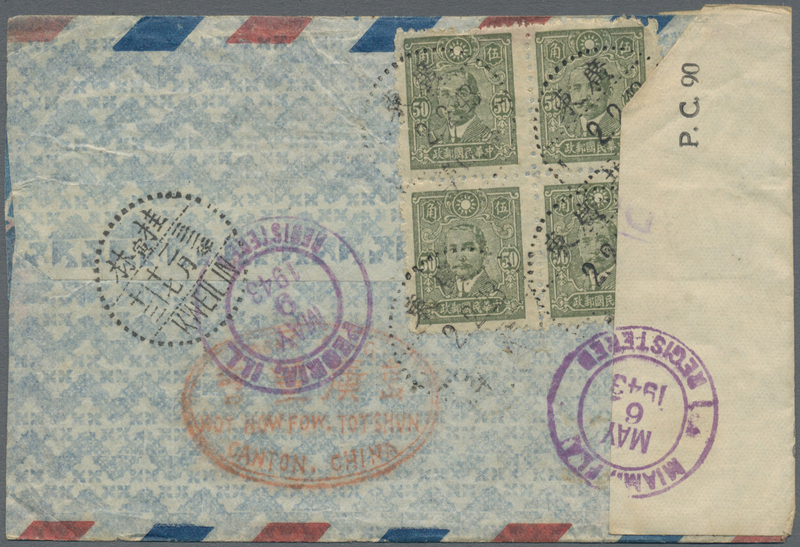 6128 Brief (cover) 448/64-ex, 464B 1943/45, airmail covers (4): registered "Kweilin 33.10.2" to Northern Ireland; resp. 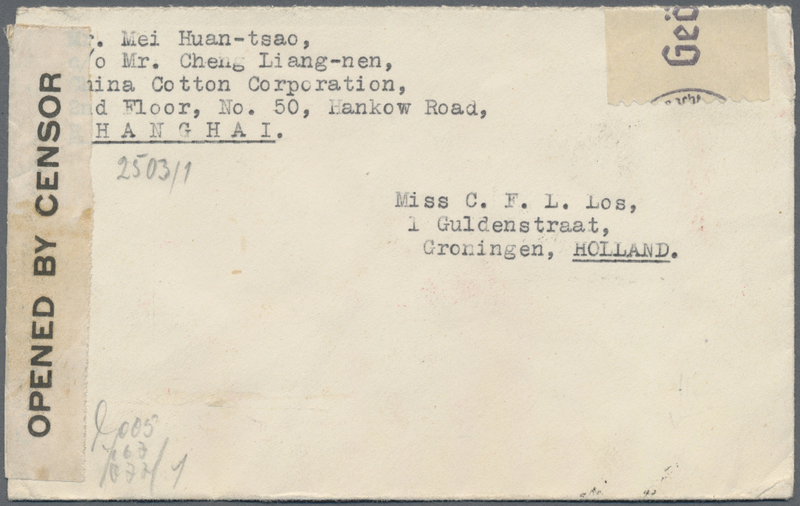 Chungking etc. 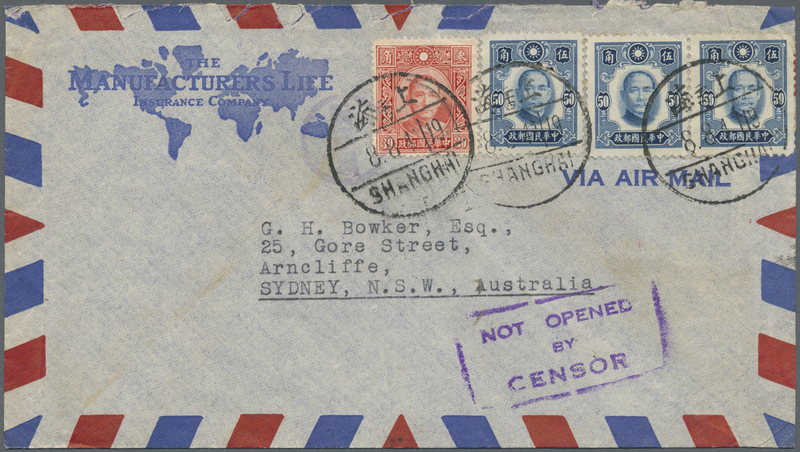 to Australia (3), by CNAC via Calcutta, inc. censorship, creases, commercial usages. 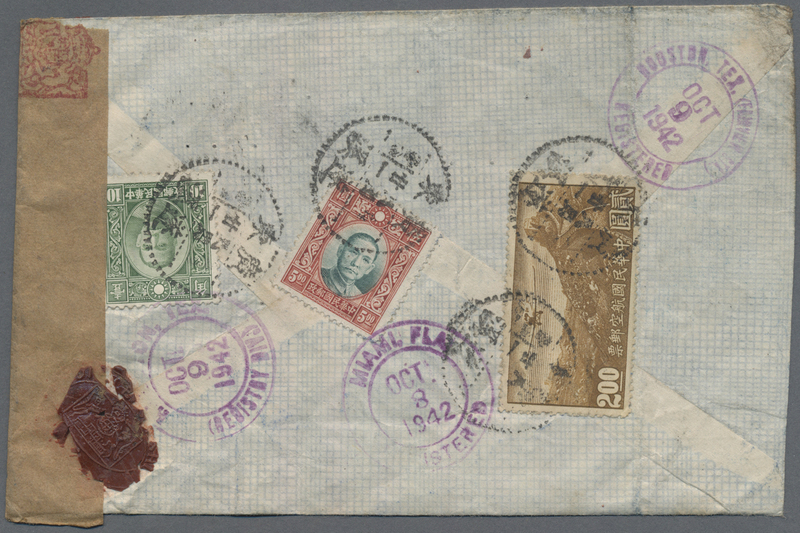 Total 4 covers. 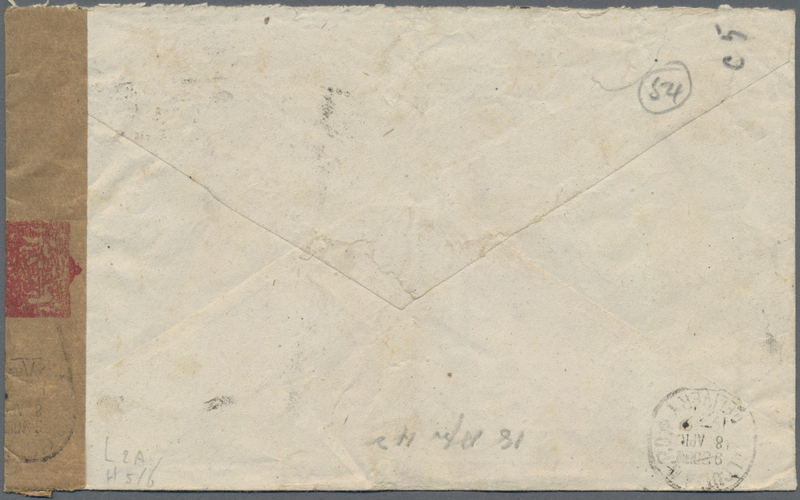 6129A Brief (cover) 461, 464 1942, SYS imperf. 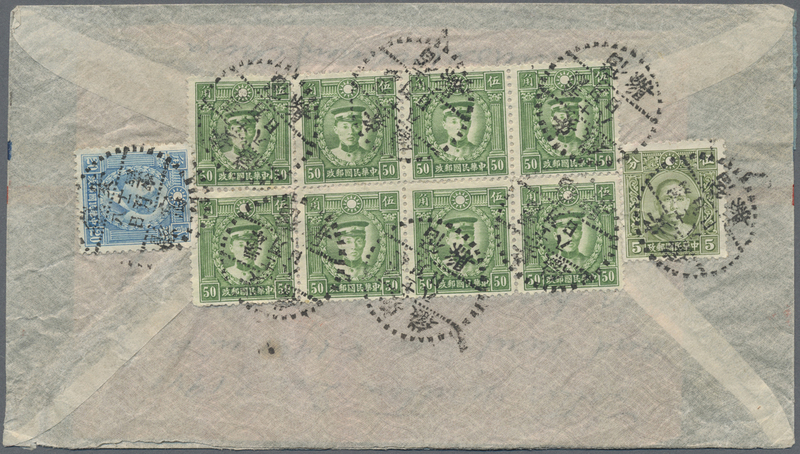 $10 w. perf. 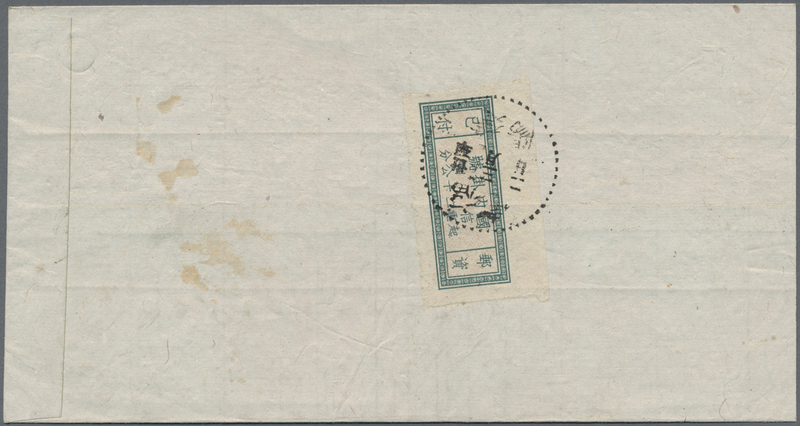 $5 tied "Hunan.Liling 32. 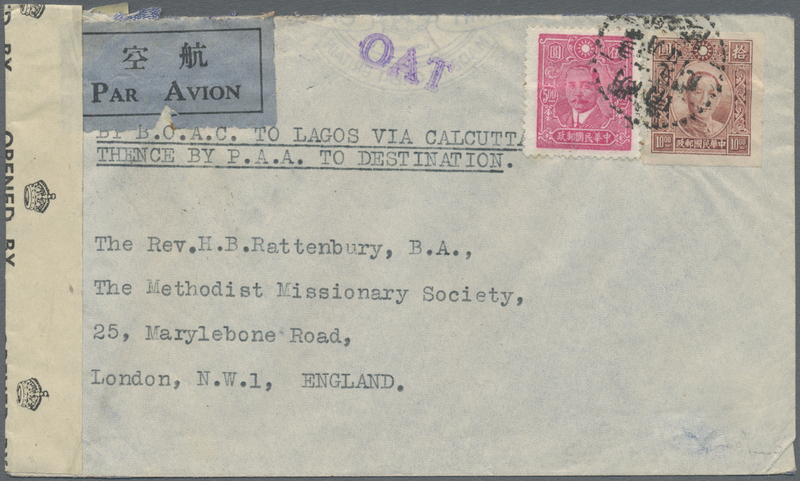 11.9" via "KWEILING 32.11.13" to air mail cover endorse "By BOAC to Lagos via Calcutta / thence by PAA to destination" with violet "OAT" to London/England, british censortape, missionary mail, rare. 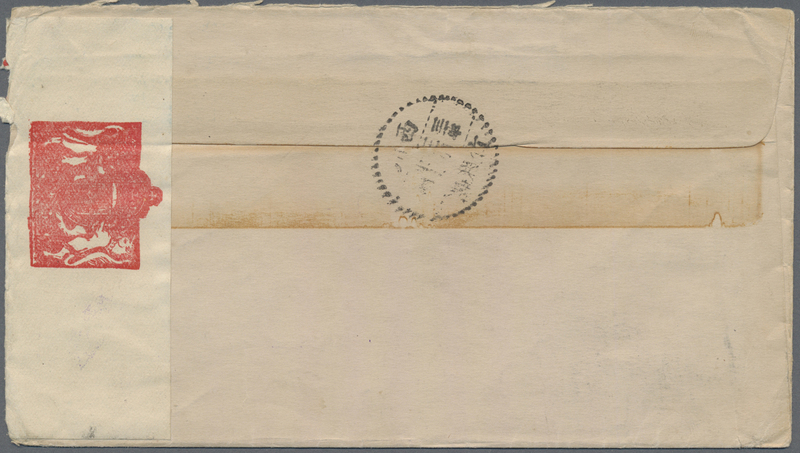 6130 Brief (cover) 464 etc. 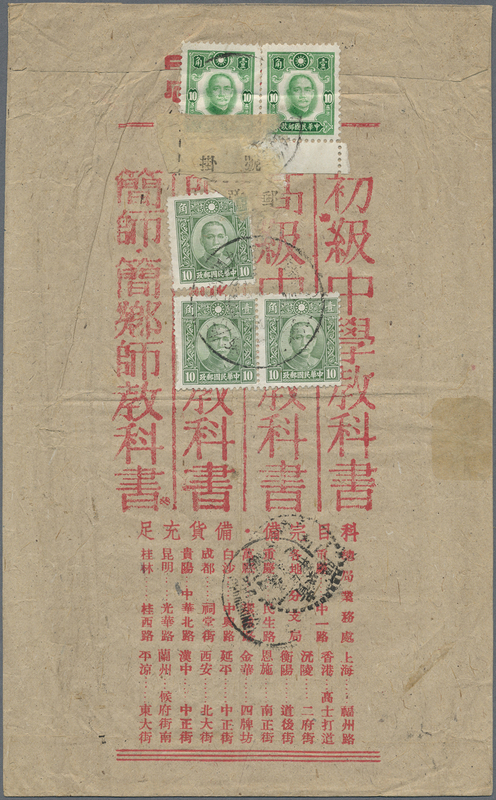 1942, SYS $10 imperf. 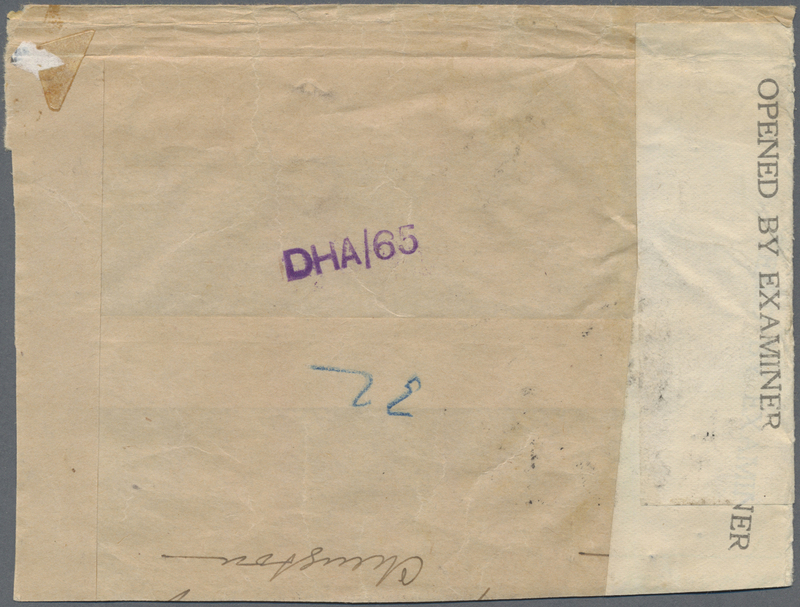 and 50 C. perf. 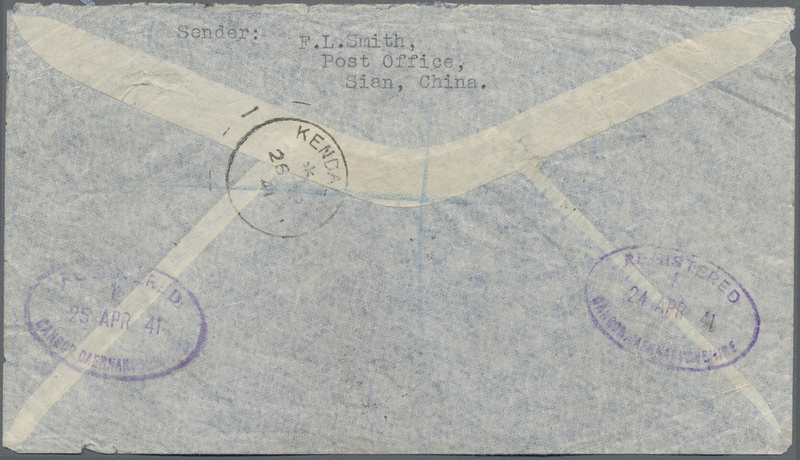 (5, block-4 on reverse) tied "Kwangtung Hoihowto 2.2.43" to registered airmail cover via "Kweiling 32.2.17" to USA, transit Miami, arrival "PEORIA MAY 9 1943", british Bermuda censor label.